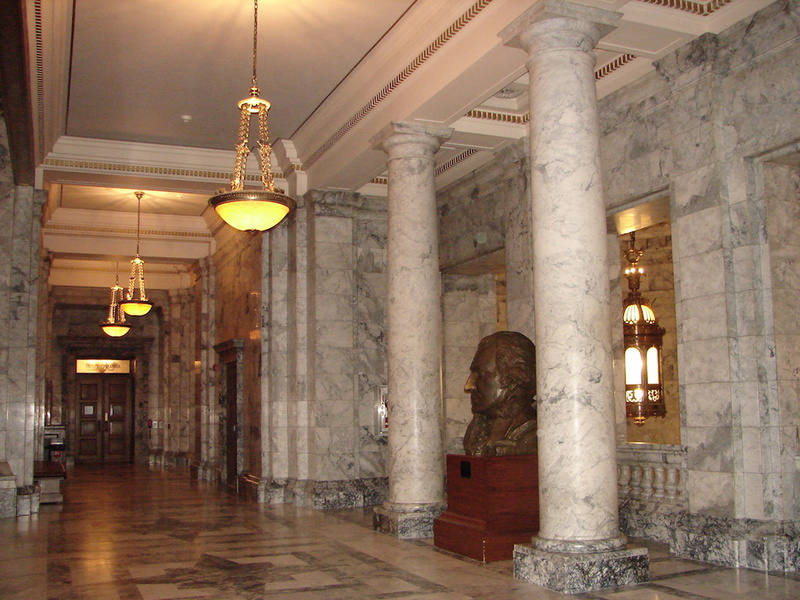 We were on location for off and on for weeks treating the walls of two State Senator’s offices in the Washington State Legislative Building. 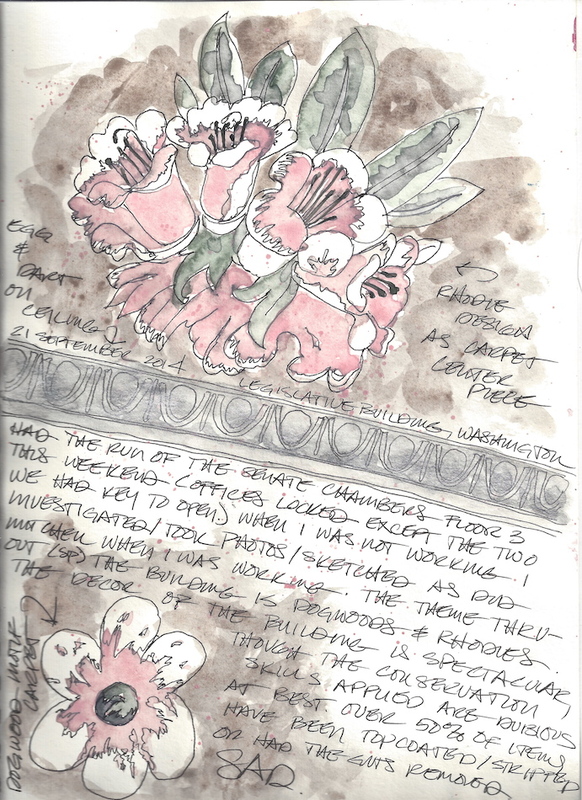 Because I sketched so many sketches on my down time (waiting for employees, shellac or for Mitchell, minutes stolen here and there) in the most beautiful buildings, I decided to dedicate a page to them. There will be more, as we love the buildings and we will visit again. 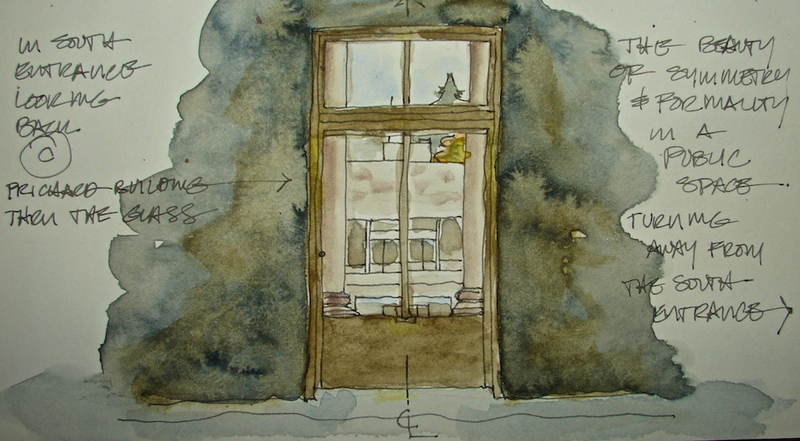 Most were sketched on site and painted in the studio. 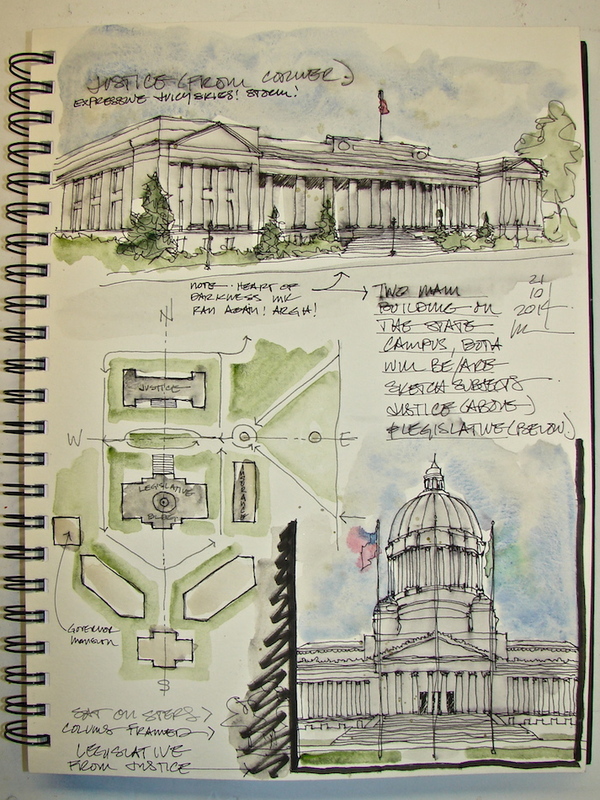 These are my sketches and memories exploring the Capitol, not finished paintings. 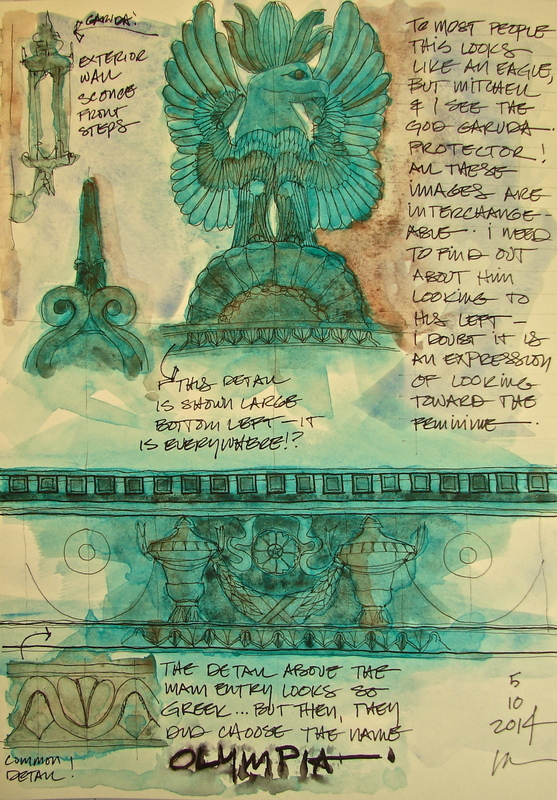 so was learning as I went — what sketchbooks are for! It is a time when I switched from throwaway pens to fountain pens, yay! I was often unhappy with the watercolors added, but posted anyways! By the end of this time I was feeling comfortable with the medium, if not proficient. Note: Areas were obscured if in my sketchbook they included a name of a person. 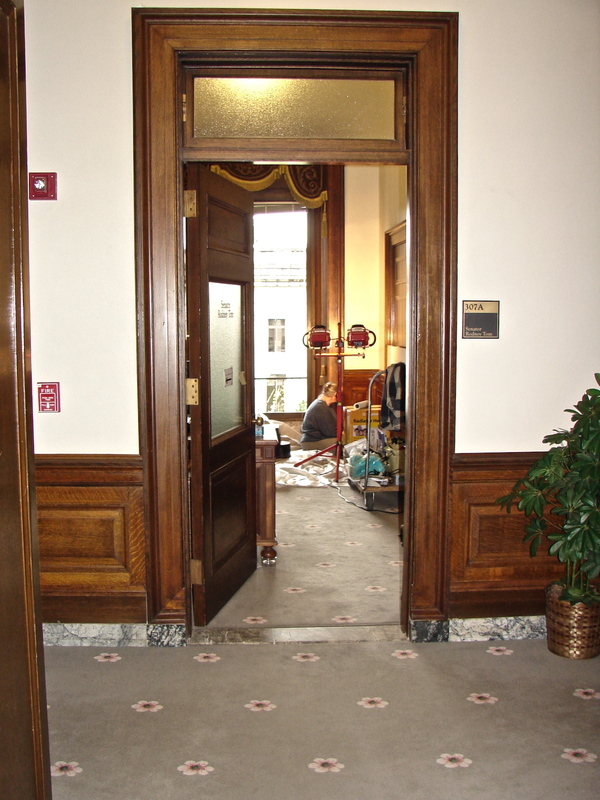 we’ve been repairing historic shellac on the wainscot of two offices in the Legislative Building in the Washington State Capitol complex. last weekend — about twenty minutes each. I took advantage and sketched him on the ladder. they remind me of my grandma. I’ve not seen such a beautiful building in a long time. Graceful and tasteful, just enough glitz! with a Brown-Black Uni-ball pen and watercolors. Last Saturday we infilled missing color to the historic shellac. 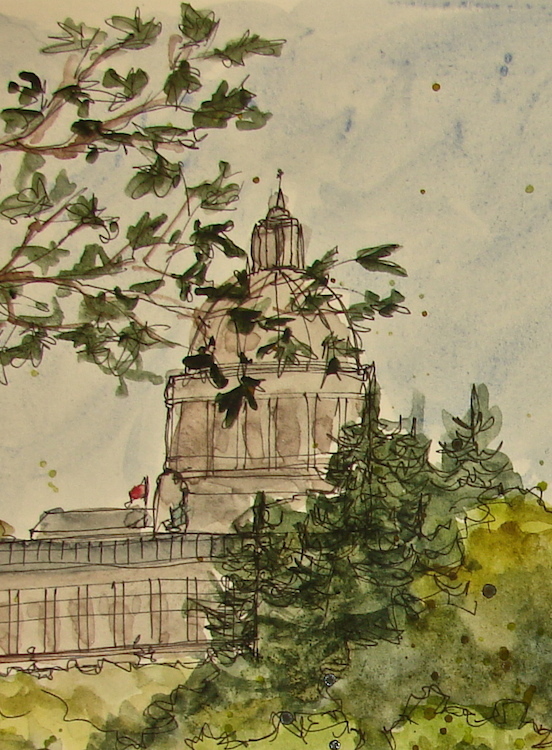 It is one of the few times when Mitchell had time to play a bit more than I did, and he took great images of the details around the Legislative Building (which I will paint!) On our way out we took a drive to Capitol Park, a lovely park below the Washington State Capitol. 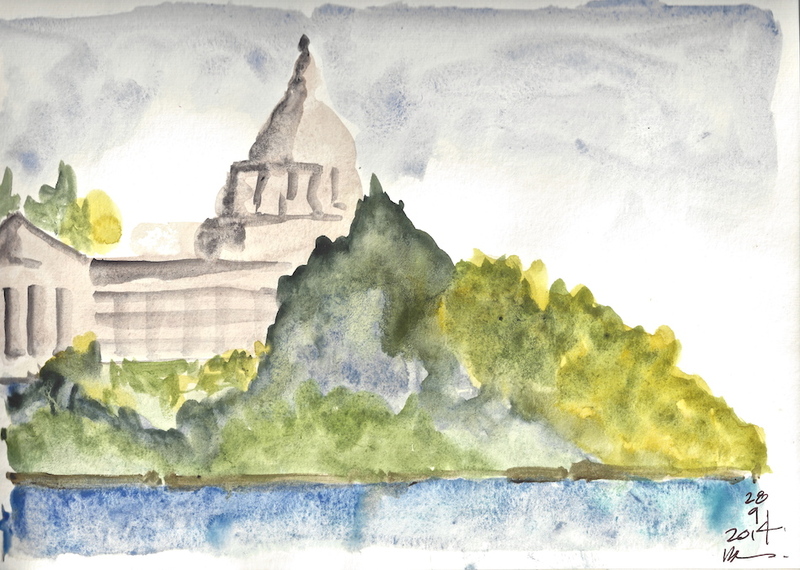 I had just enough time to paint the Capitol on an early autumn day before heading back home. The first time through I sketched then laid in color, above. The second watercolor I simply dropped colors quickly. I have my favorite of the two — do you? with a Brown-Black Uni-ball pen and Daniel Smith / QoR watercolors. 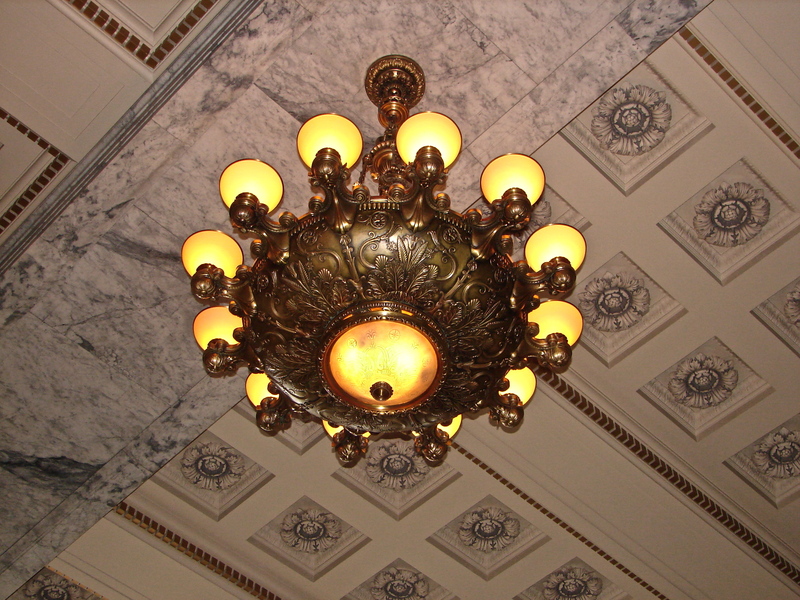 The chandeliers are a crowning point in the Washington State Capitol Legislative Building. 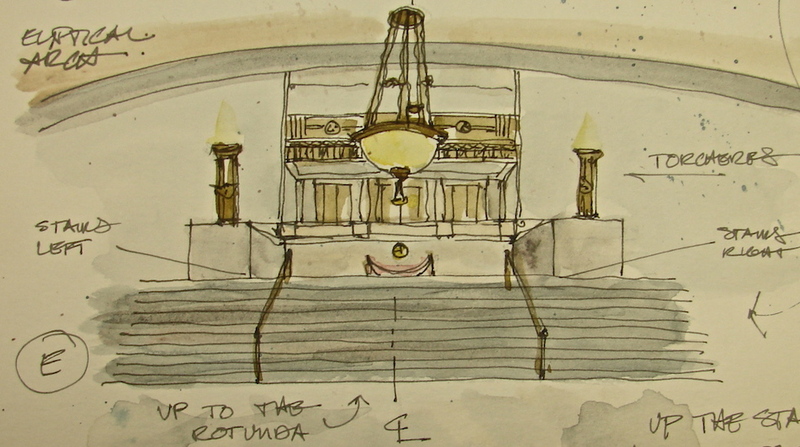 The architects felt the most important fixtures were those in the north portico, in the rotunda, and in the entry in the south porte cochere, as well as the large gathering rooms. 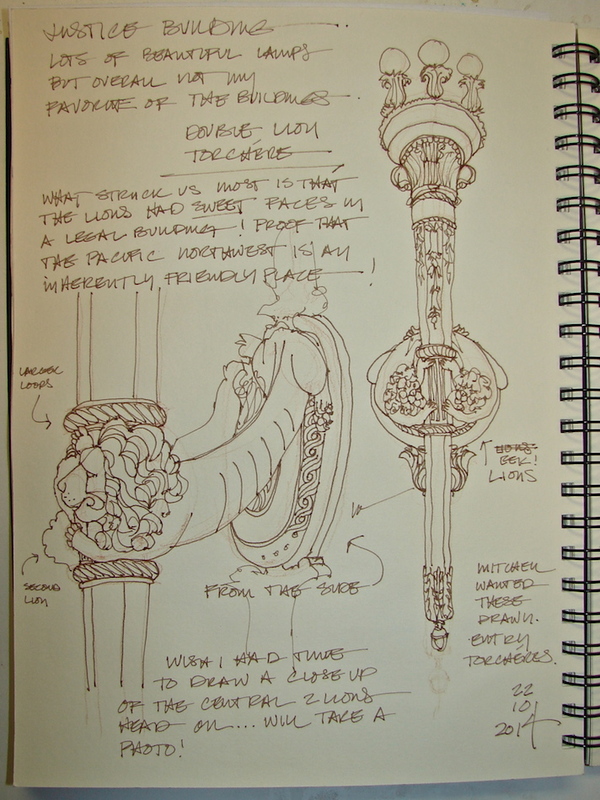 They went all the way to New York City to have Louis Comfort Tiffany create the fixtures (no one here in this wild wild west was competent), which, along with the six bronze doors, cost the state $158,000. They were designed by Carl Moser. I love the chandeliers in the entry in the South Porte Cochere. colors it nearly copper in places, so the lamps look like they are on fire. 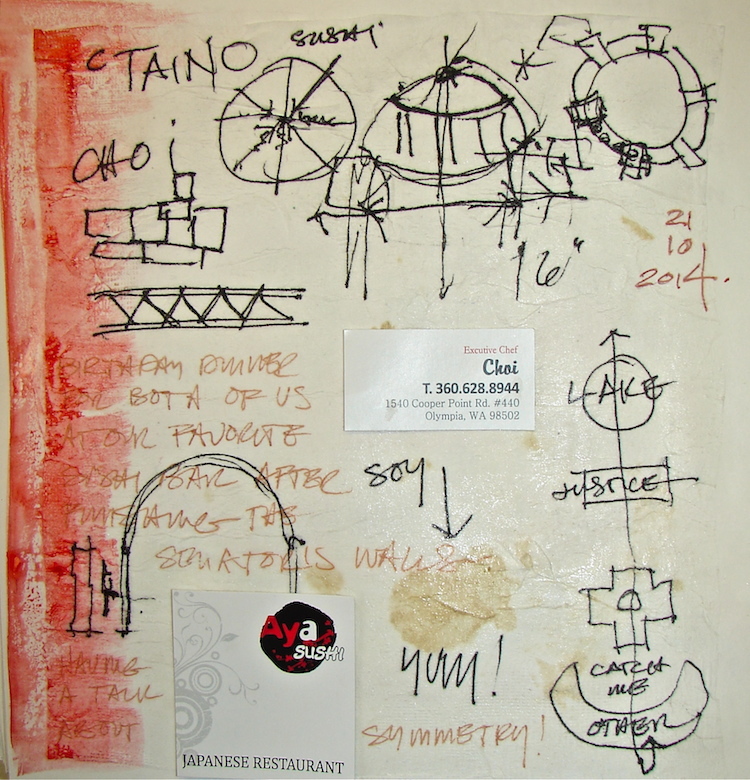 I started with sketches to understand the construction. I didn’t lie on my back to sketch the underside because my architectural training allows me to see in plan anything I look at — building plans, drawings of the cars I sit in, etc. I am glad, because I really would have looked ridiculous sprawled on the stairs. 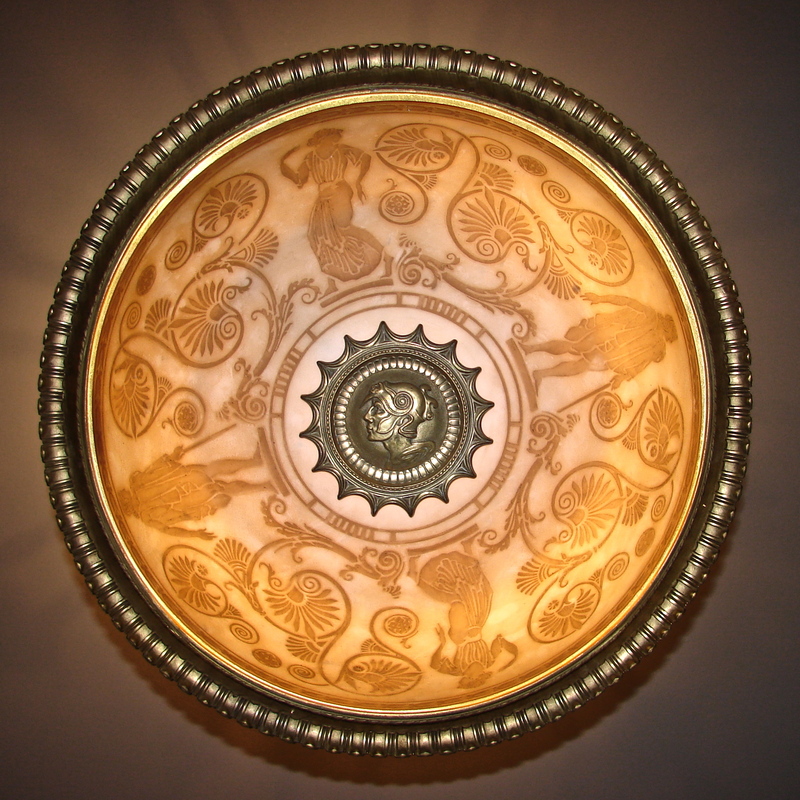 and attaching inside the fixture, so they do not mar the exterior decorative bowl. straight into the light, and you are also closer to the fixtures. I cheated when it came to the details. 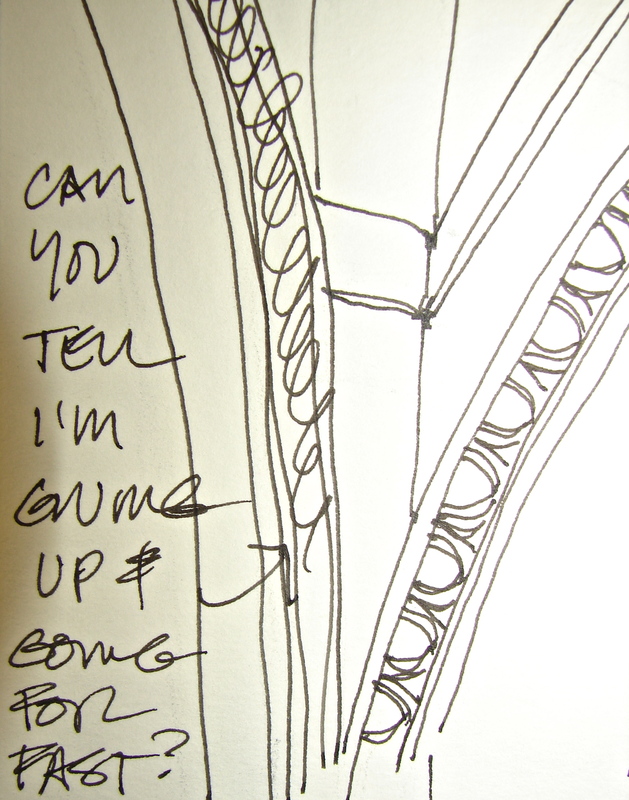 I took a close-up and sketched at home. (because it is so far away) in the two side views. 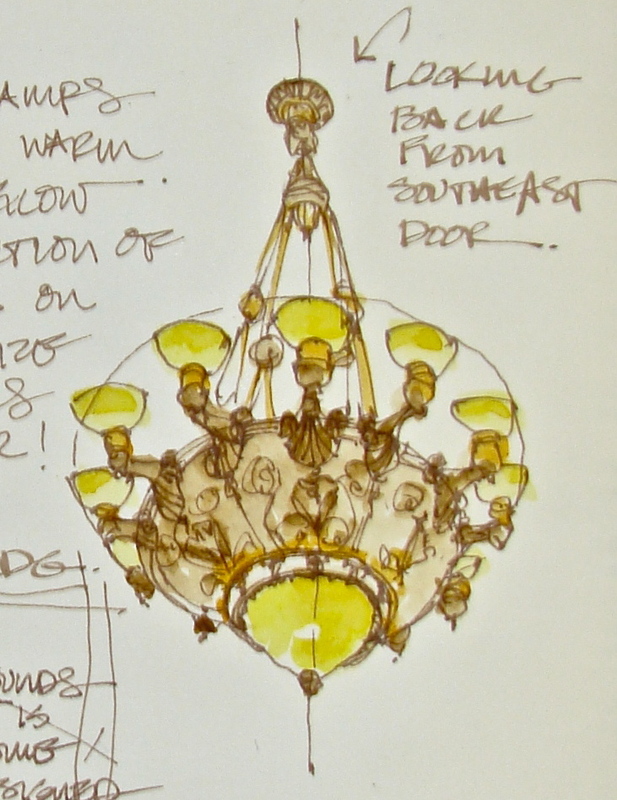 The bottom band, just above the large glass lamp at the base, has the teeny tiny egg-and-dart motif found everywhere. with a Lamy Safari pen, a Pilot Preppie pen, Polar Brown Noodlers ink. 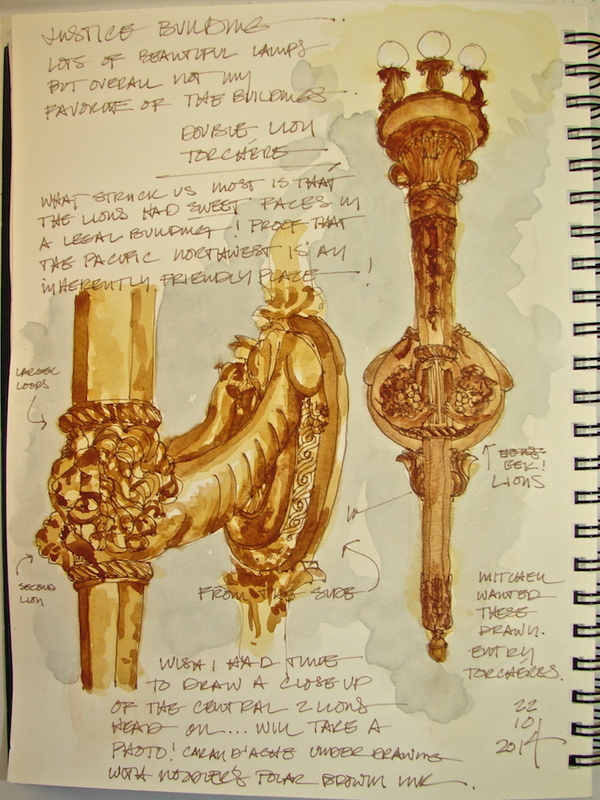 Daniel Smith and nickel azo yellow QoR watercolors. I began by understanding the geometry of what I was drawing, which I think is even more important in symmetrical buildings. If a building is wonky to begin with, then your mistakes may not be noticeable. With formal symmetry, if things are off they jump out at you. 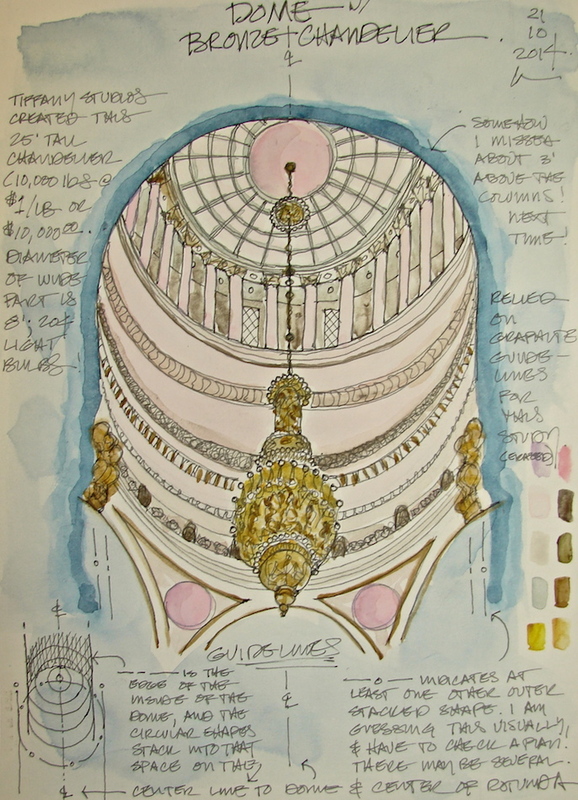 I did a pencil sketch roughly like the drawing below (the underlines were eventually erased), understanding that the dome was going to be a series of stacking circles along the center line of the drop of the chandelier, except many would be cut off from view. There were several other circles stacking on the center line which correlated to the circular balcony at the top of the dome (I MUST find a way to get up there sometime). 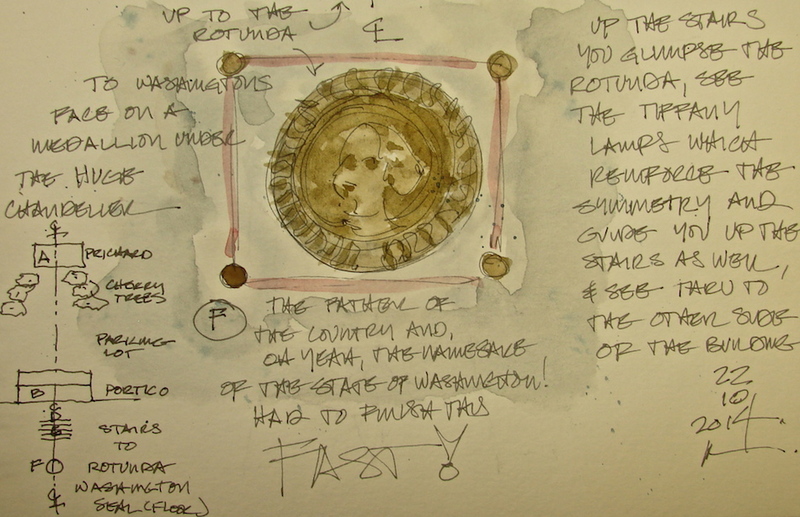 As we reached the area where the cruciform plan of the rotunda reached out under arches in four directions, I would let the drawing go, so as not to make it too complicated. which I also drew for another day). 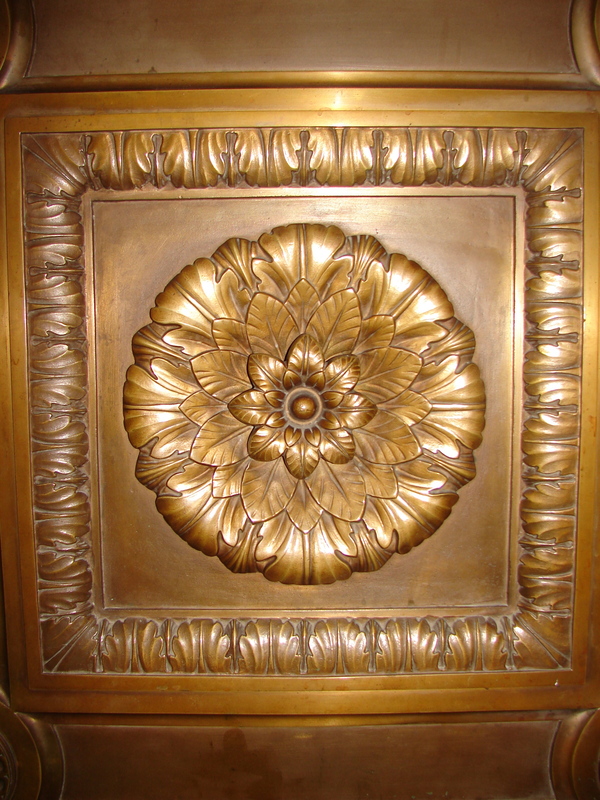 The building was finished during the Depression; money to paint the decorative elements was not available.The building was used unpainted until the late 1980’s. and yet they work, and when you see them next to the lovely marble the architects chose, it is inspiring, elegant, and beautiful. 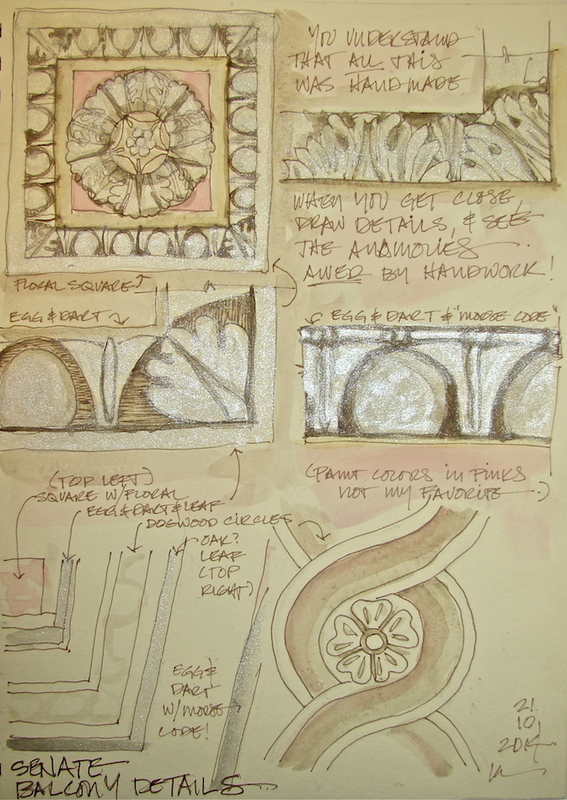 Drawing the details up-close I struggled to have the motifs match. I began to realize that the motifs are NOT symmetrical in proportion. They are hand-made. Sitting in the gallery looking at all that detail work, knowing it was all carved/crafted by hand, is awesome. 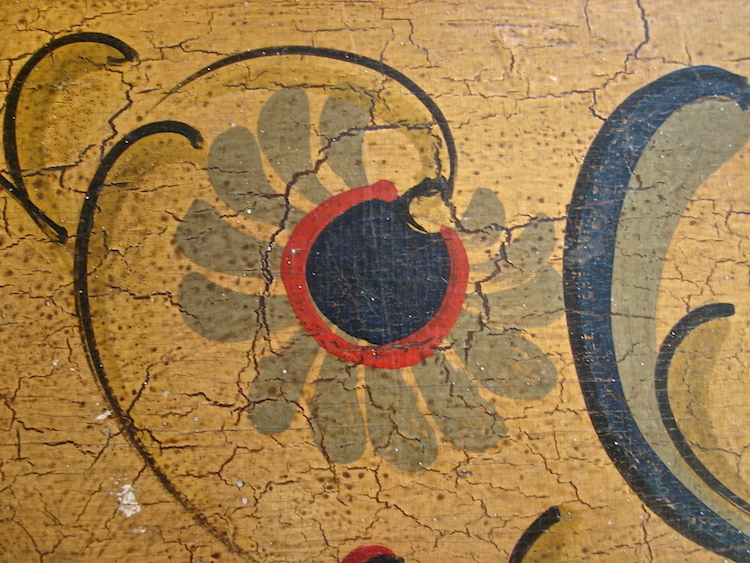 No two dogwood/oak flower motifs are exactly the same, and the egg-and-dart motifs vary! I sketched background guidelines in pencil before inking the details; I had a layout and basic proportions to ink within. 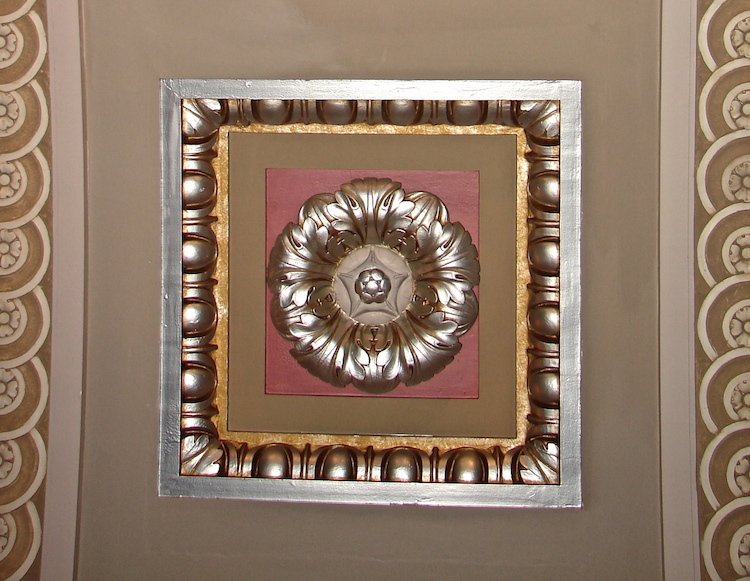 Silver was used on so many motifs, yet it had a gold-tone overlay to some of the paint (above), and also in the crevices. That is why I used Polar Brown Noodlers ink. The word is not out for me on using silver paint; note the detail images above. Yes, the motifs were silver, but the silver is not the same as the watercolor paint, and it lays oddly. I may stick to grey in future. I thought I knew everything (okay, maybe not everything, but a lot) about the egg-and-dart pattern, but in a what-the-hell inspiration I looked it up on Wikipedia. Totally learned something! 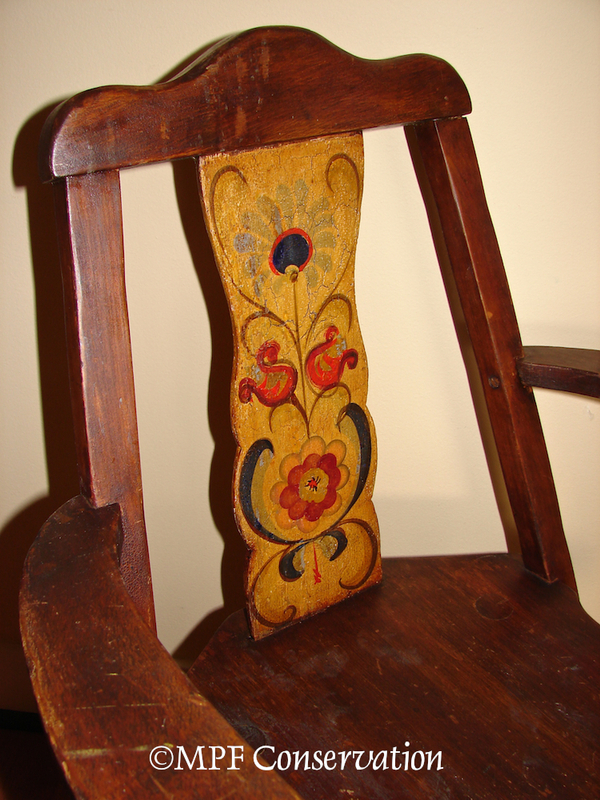 The oak leaf pattern is a variation of the egg-and-dart! 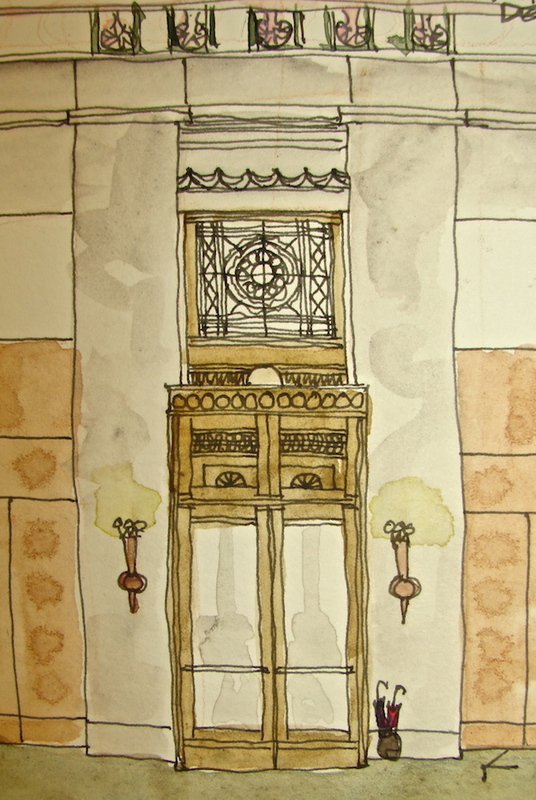 Drawn in an Stillman & Birn Delta journal with a Pilot Preppie pen, Polar Brown ink, and Daniel Smith (silver, quin gold, tigereye), and Sennelier (quin red, white) watercolors. 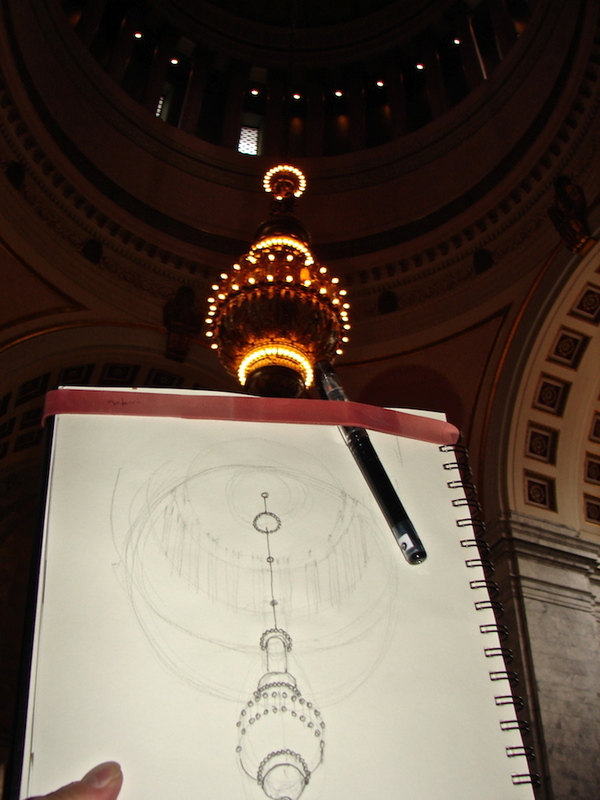 Mitchell took great images of object details around the Legislative Building, and the torchére caught my eye. Not the same as painting in front of it, but fun nonetheless. I took the risk. I like the gentle washes and think they add to the page. in the interior spaces. They are every bit as beautiful, and highly detailed. 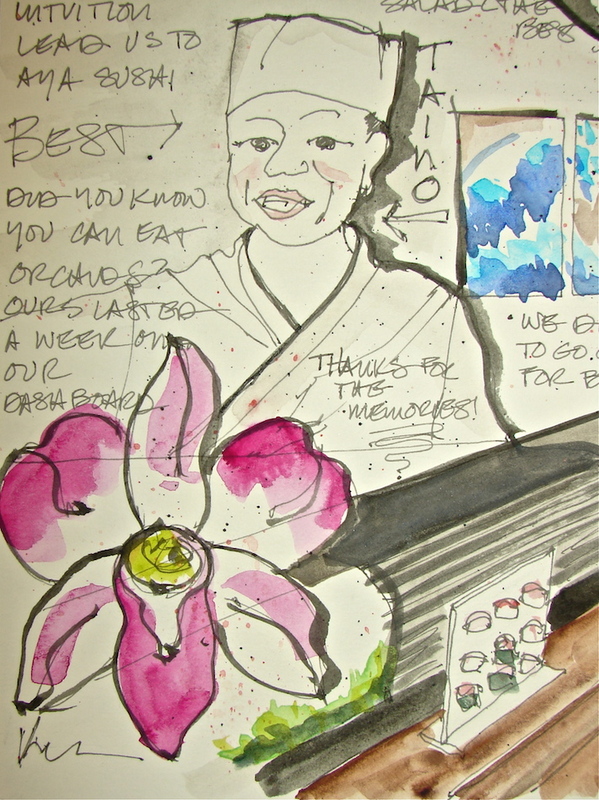 I drew onsite, and added water-color in the studio. these are all opportunities for learning and I like the effects of the Sleeping Beauty Turquoise and Minnesota Pipestone and Hematite by Daniel Smith. The deep green-blue is Phthalo Blue by Sennelier. with a Pitt pens and Daniel Smith / QoR watercolors. 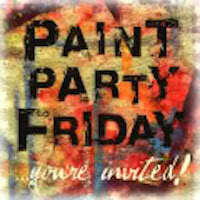 Happy Paint Party Friday and Friday Sketches! I want to give you context on this amazing carpet in the room! It is SO easy to overwork a watercolor. I wanted the colors to be as bold as they were in the State Reception Room. The watercolors were not vibrant enough, coming through as pastel version, so I added second and third layers. *Sigh* Muckity muck muck MUCK. Unfortunately, this is also a case where the colors are pretty accurate but the whole does not appear the correct palette. My palette is simply too bright, too orange, too pink! 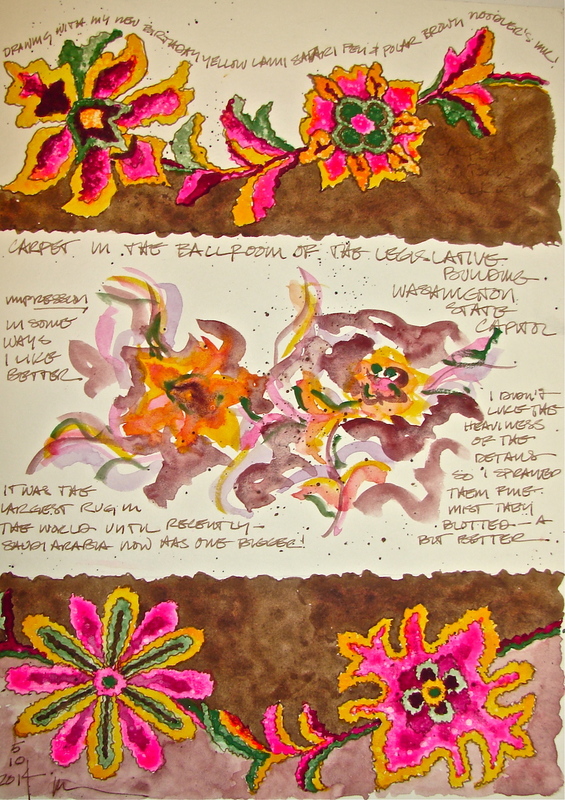 sketch a faster impression of the carpet in watercolors. Quickly. 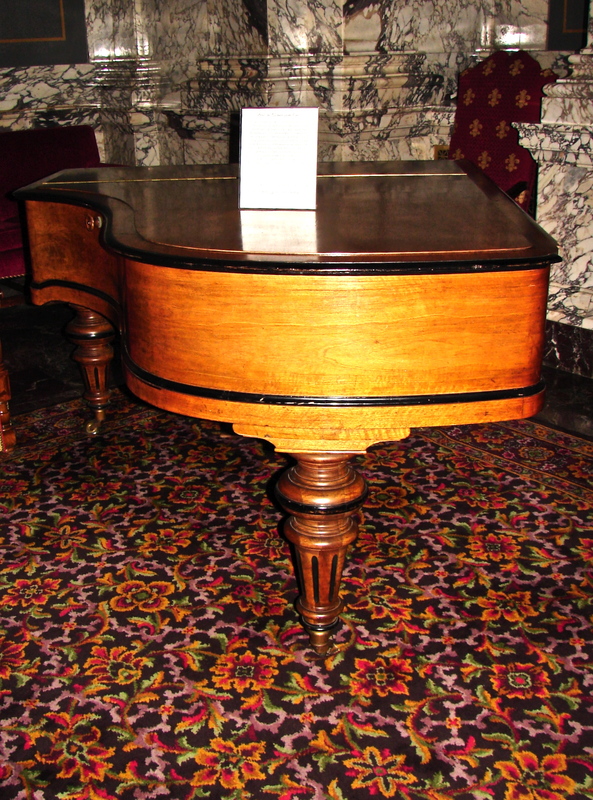 This impression is closer to the feeling of the carpet when you are in the State Reception Room. Then to save the overworked watercolor, I first tried spritzing a paper towel and blotting the overworked watercolor. I lifted a lot of paint, which helped, but it still looked all wrong. Then I tried spritzing the water-colored borders and blotting directly. This resulted in the mottled effect below. NOT what I was going for, but an improvement! I really love this carpet — odd for me — and may have another go at it! Maybe I can sit on the floor outside the glass doors! Lamy Safari pen, a Noodlers’ giveaway pen, Polar Brown Noodlers ink. 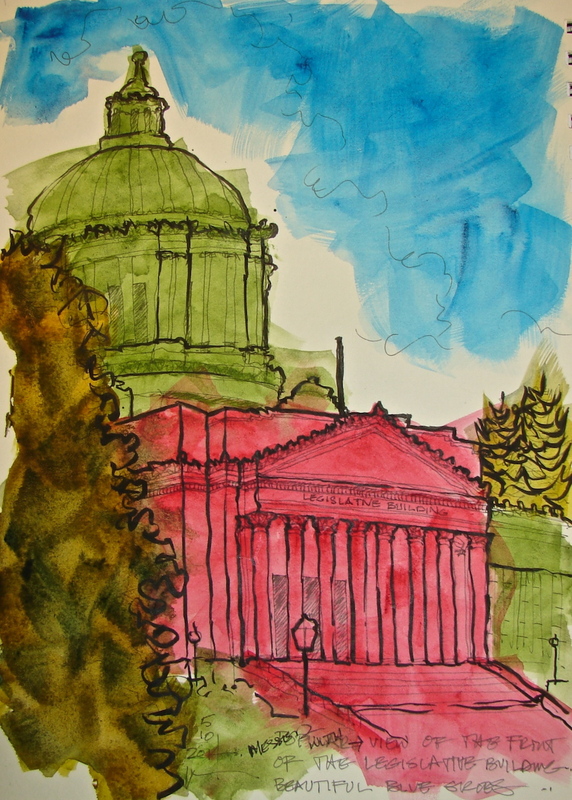 Daniel Smith (Opera Pink, new Gamboge, Chrome Green — big mistake as it is opaque — Perelyne Maroon), Sennelier Quinacridone Red, and QoR Terra Verte watercolors. I was hooked during university. 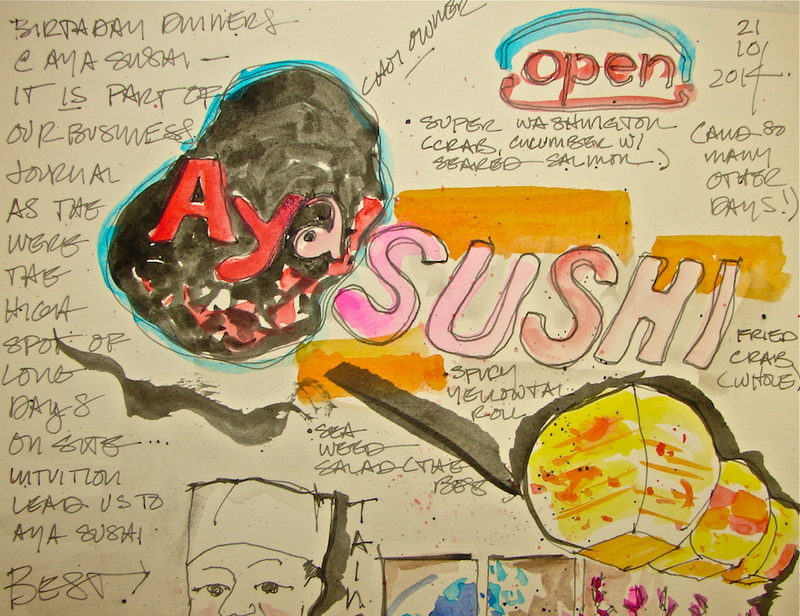 Aya Sushi is the best sushi I’ve had since Lalaland! they were open while working on the Senate offices. (gads I apologize if I am spelling his name wrong). On our birthdays made a salmon sumthin’ in a martini glass on the house. Dishes came with beautiful orchids. We put them on the dashboard of our Mountaineer and they lasted a week before dying. Did you know they are to EAT? 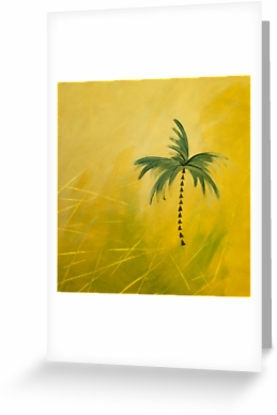 Taino said they are not decoration — but told us too late! On top of all that, the surroundings are colorful and beautiful. Japanese brush paintings of waves, very traditional. Located in a mall, you wouldn’t suspect a great restaurant is behind that neon sign. on top of a crab-cucumber-sumthin else roll! Second was an amazing seaweed salad. YUM YUM YUM spicy yellowtail hamachi fried soft shell crab roll unagi . . . I didn’t draw on site — too busy munching happily. better looking than my sketch! Lamy Safari pen with Noodlers Lexington Grey (also with brush); Daniel Smith + Qor + Sennelier watercolors in my Stillman & Birn Delta book. Oops lest I forget, my favorite part, the company of my husband. Talking with pen in hand. 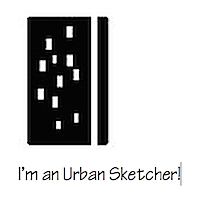 I guess I did sketch on site. 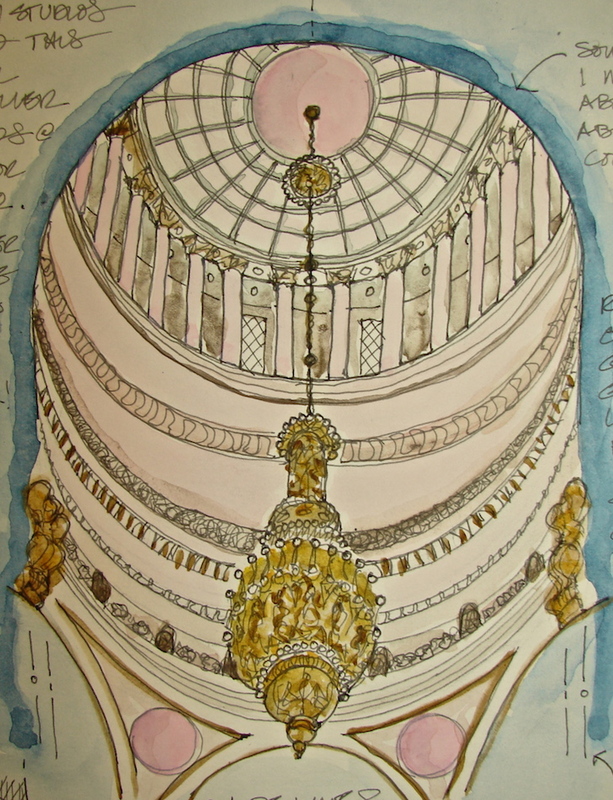 . .
the dome with flanking “tomes”, and many details. 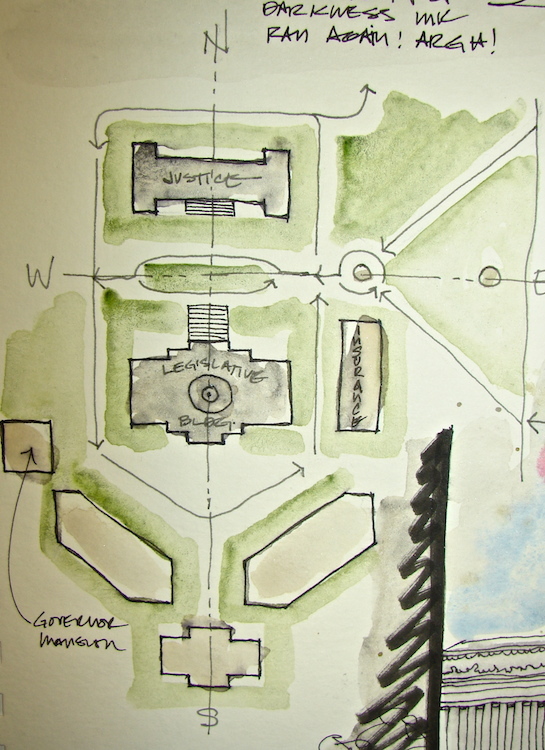 Sketched onsite, and watercolors added later. 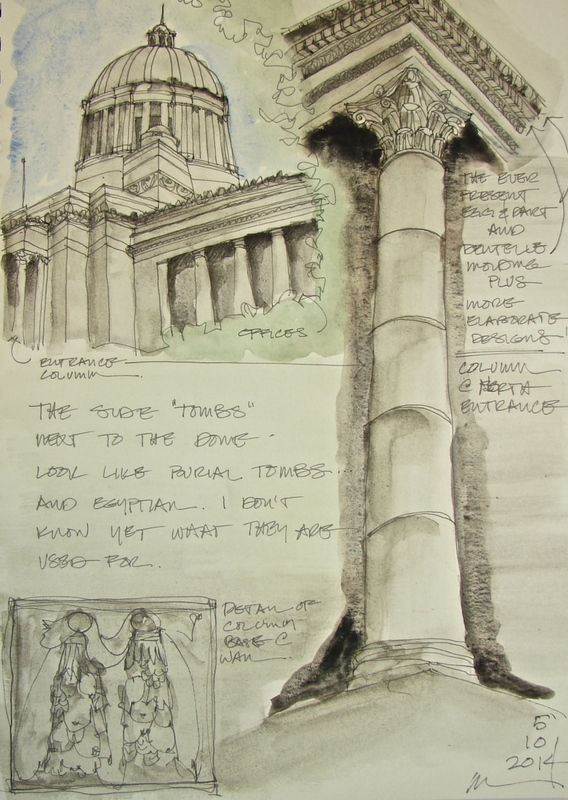 The column was drawn looking up from the edge of the East side of the steps. QoR (Terre Verde and a grey) watercolors. draw on top of the arches and gallery. 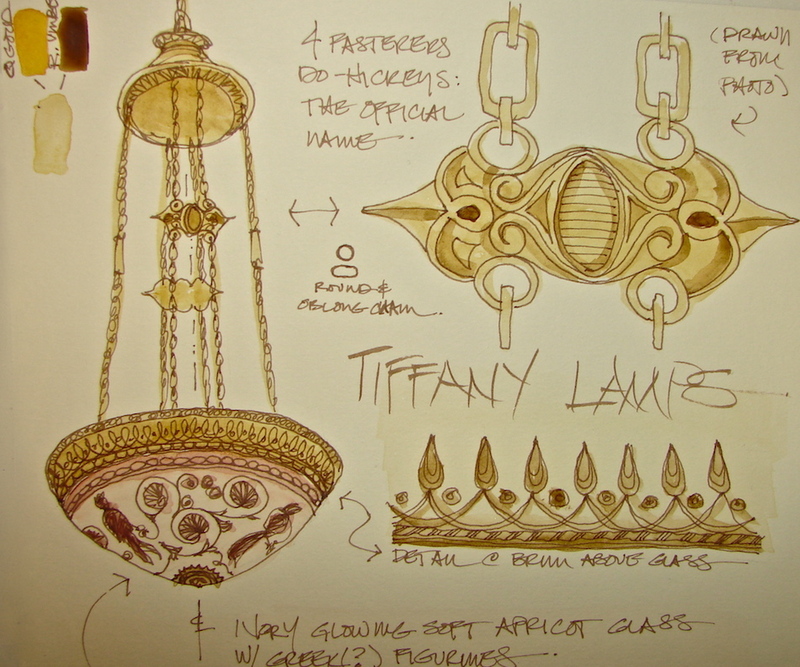 The chandelier reminds me of a candelabra, and that may be what Tiffany intended to inspire. The state keeps the Senate incredibly dark. I hear stories of ghost wandering the Senate and can believe it! Perhaps when the Senate is in session the lights are not set low? I blocked the basic design out in a Pentalic HB Woodless pencil (Grumbacher). 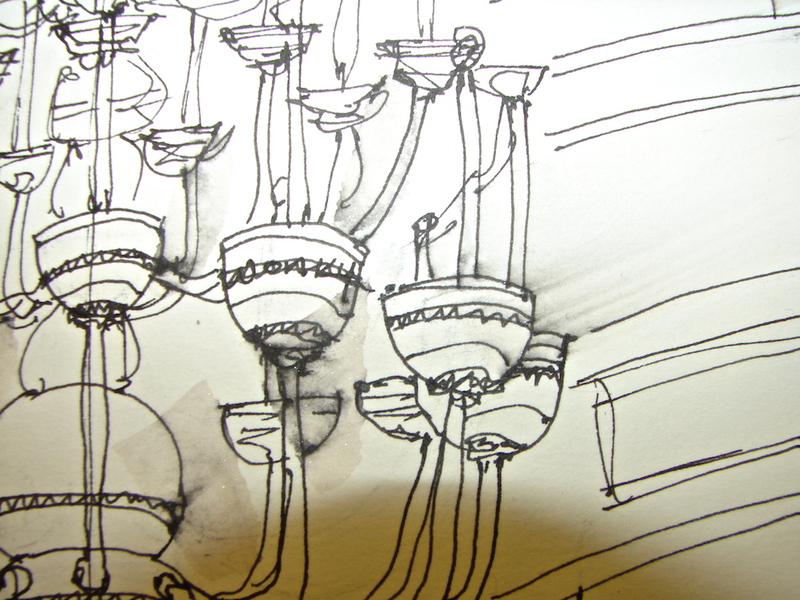 I was inking details and the design of the chandelier was making me a bit crazy. 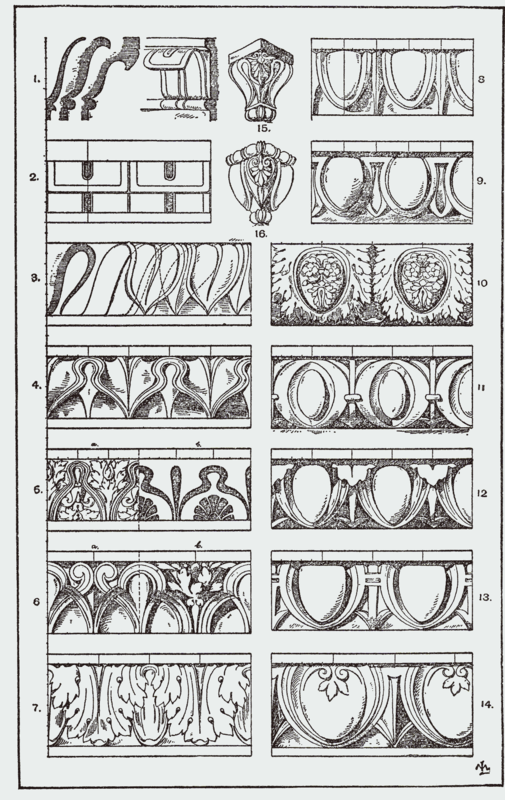 top eight lamps) tiers aligned; the middle (ten lamps) were off-center. 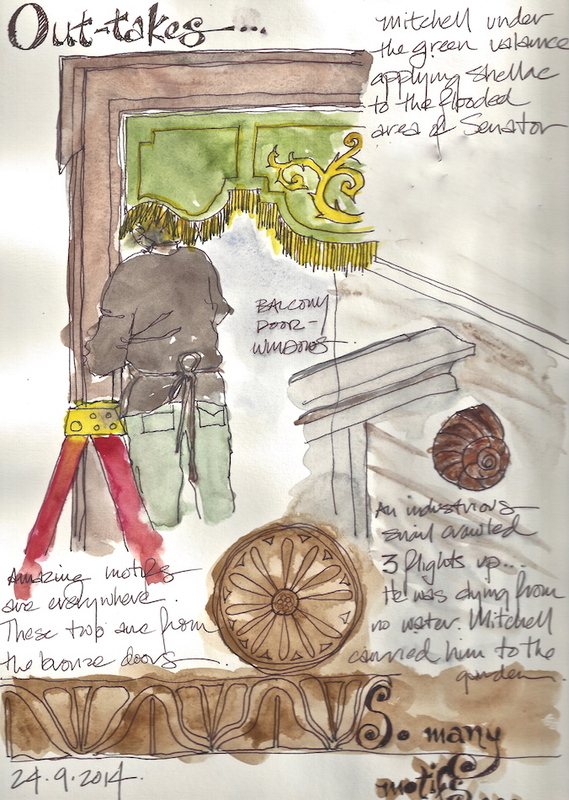 Back to my seat on the entry floor to add detail to the graphite ghost blob I sketched in the corner. I was sorry I left my camera behind; I wanted to take an interim picture of the pencil sketch before I started inking. I’m not in love with this chandelier, andI discovered that I have to be in love with the object in order to give it your all. Wonky lines no longer bothered me; I wanted to finish as Mitchell was wrapping up for the night. 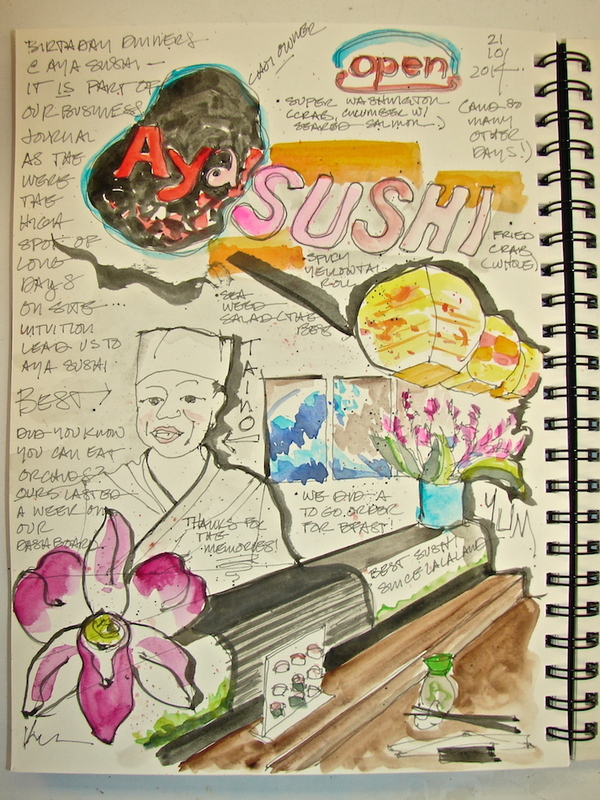 I wanted to head out to Aya Sushi for dinner. 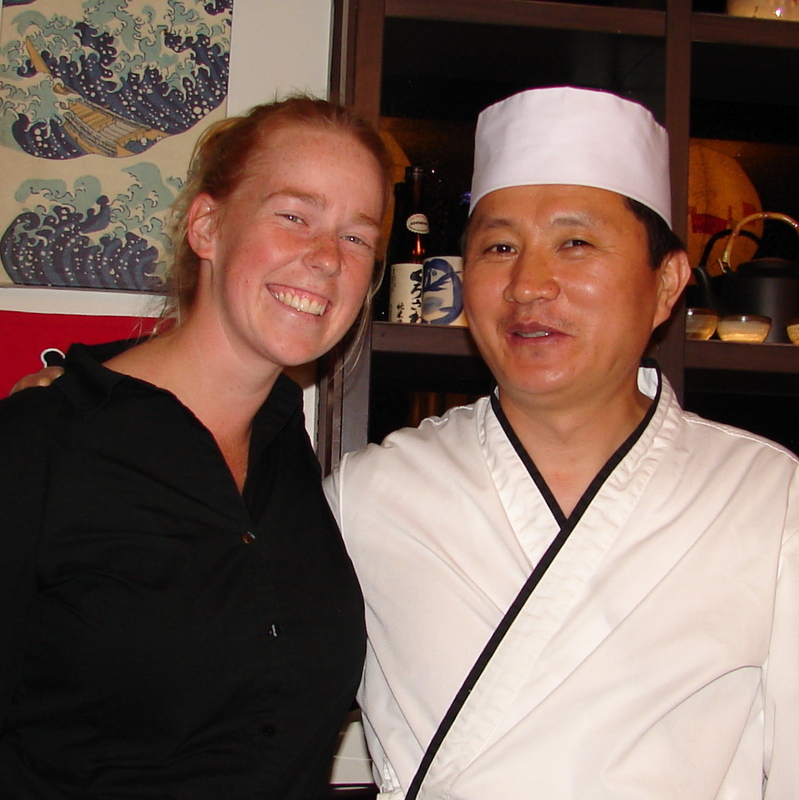 The best sushi in the Pacific NW! see the darkness and the ornament. 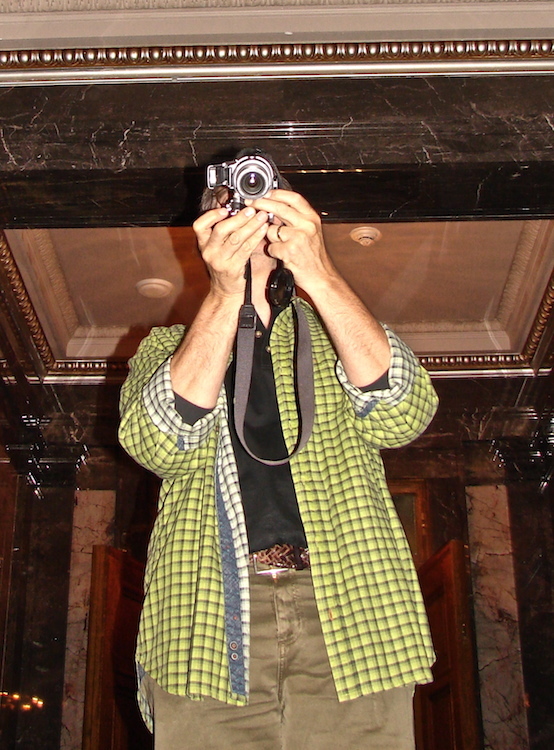 He also took pictures of me, and those mysteriously disappeared. Oops! but loved the Heart of Darkness ink! At one point spirals appeared to indicate the shape of the egg-and-darts! added color. 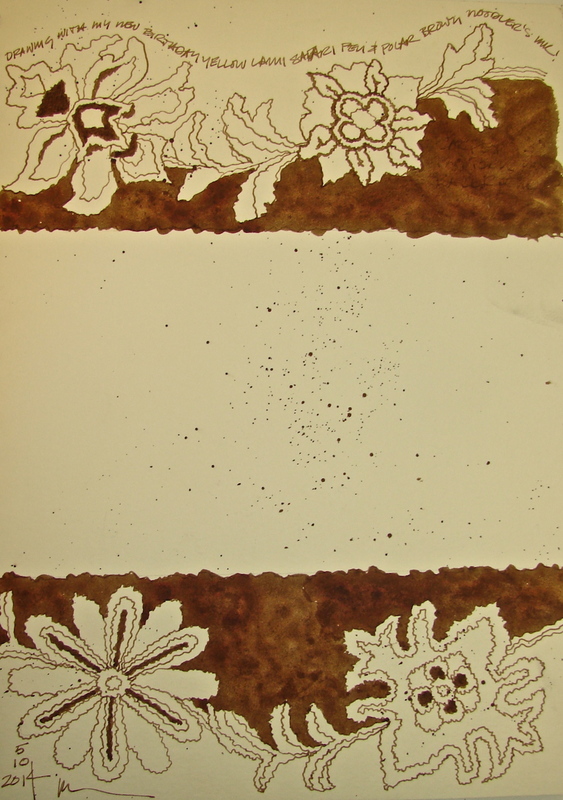 Unfortunately, at the first swipe of watery glaze, the ink began to move! AAACK! I cried. I went online and commiserated with friends. the drawing was loosey-goosey and wonky, so went back to adding color. 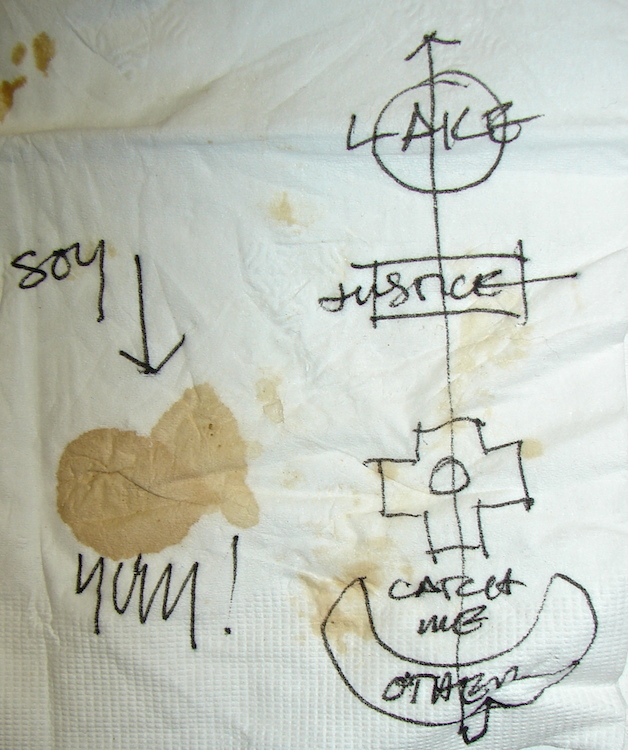 The ink still bled in places and I had license to make messes. I did! ALWAYS TEST AN INK OUT ON EACH TYPE OF PAPER! early in my painting career I made jars of it trying to mix a soft brown acrylic color. for candlelight ambiance. Finally, I think my days of using silver are over! Holbien (quinacridone gold) and Sennelier (quinacridone red, white) watercolors. 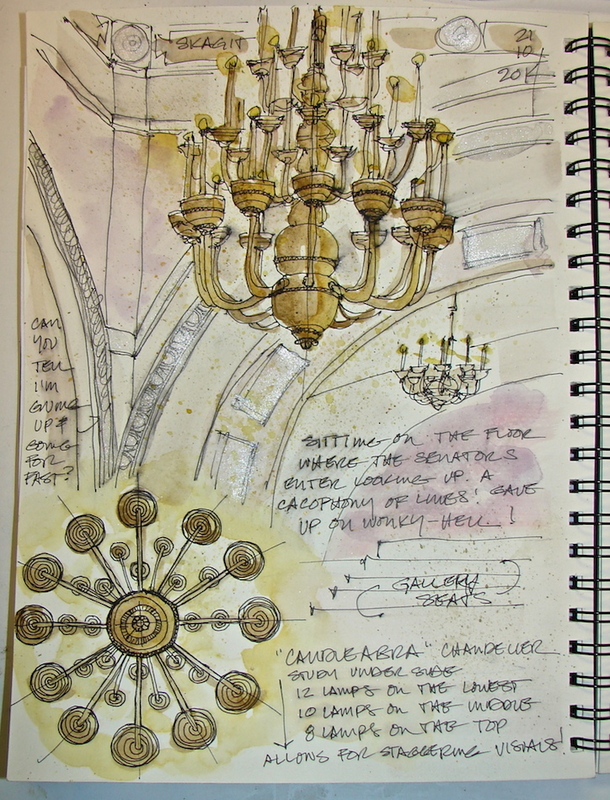 It is unusual for me to start my sketchbook posts with photographs, but this Tiffany chandelier is simply too beautiful. I did not do them justice! to the various rooms, providing a delicate glow to the halls (see more images below). I left full size for you). I laid on my back to get the photograph above. Yes, people stared. I am over it! and is a throwback to Greek times. of the Athenian red pottery. 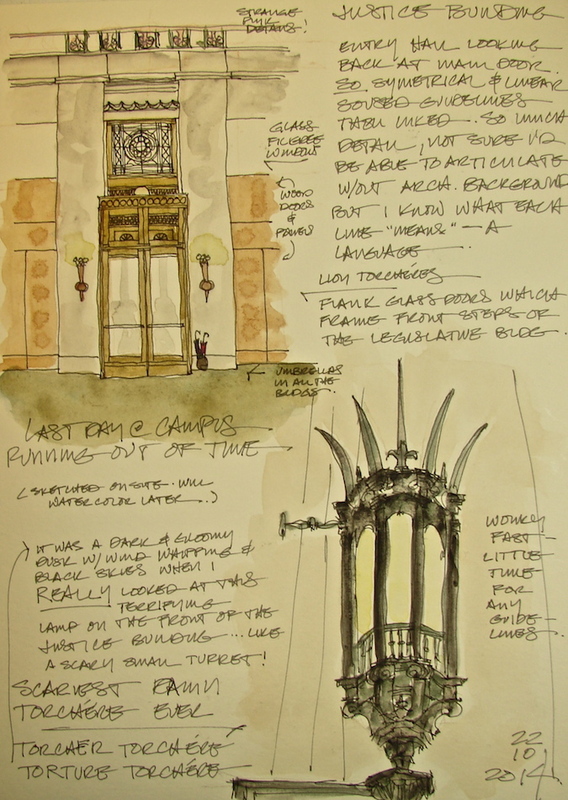 Drawing slows me and brings me to the details that I overlook when I am simply walking and touring. 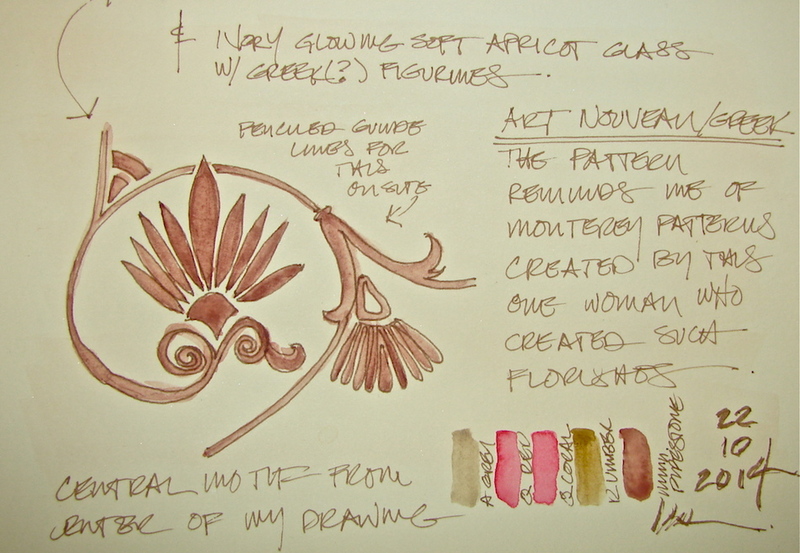 I think about Louis Tiffany, the unnamed artists who worked for him, and who inspired him. Did the architects request these designs? So much is not discussed in the books we buy. so many painted decorative pieces of Monterey. There was one artist who created lovely flourishes. 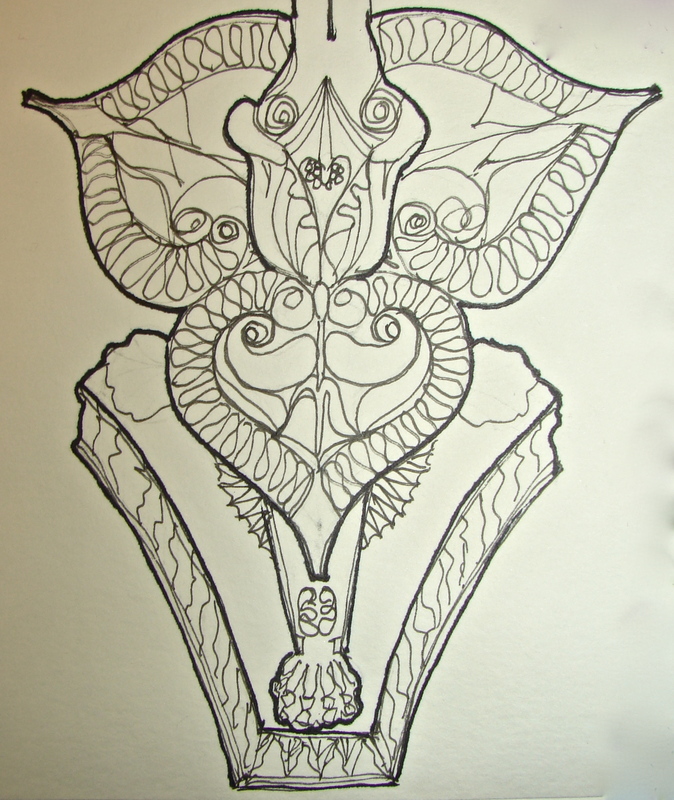 While drawing I had a physical memory and realized their origin began in the floral flourish above. Attention to was paid to the chains and the cover plate in the ceiling. and the chain design, which is a mixture of perfect circles and oblongs. They THOUGHT about that. Where is this attention to detail in our world? a Noodler’s giveaway pen, and Polar Brown Noodlers ink. but can FINALLY say I am freeing myself to go quickly to pencil. quinacridone coral, grey), Holbien (quinacridone gold = super creamy), QoR (bohemian green) and Sennelier (raw umber, quinacridone red, white) watercolors. I roughly put the colors used next to the areas for which they were mixed. I tend to lay down to get ceiling shots. 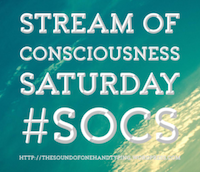 I also tend to take my shoes off anywhere I can. 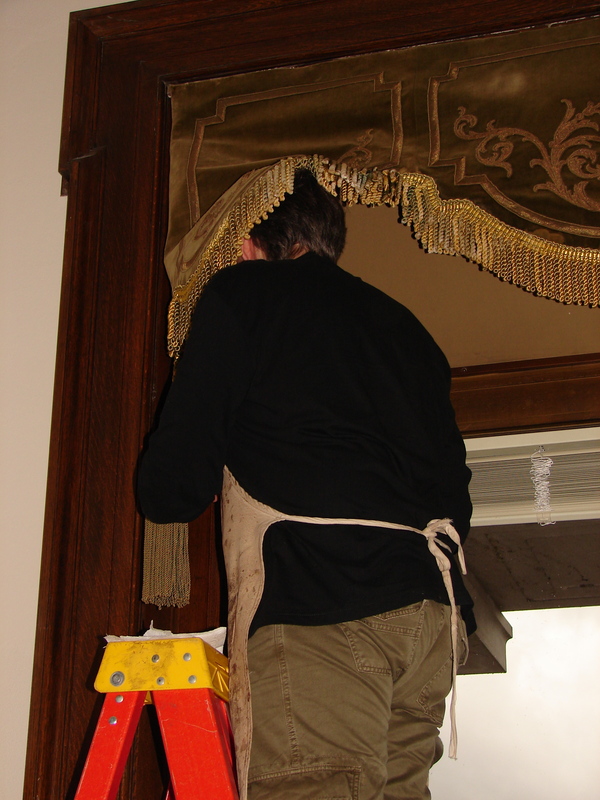 I was on a break shellacking the wainscoting. catching me I caught him too! in the hotel room later. Lexington Grey Noodler’s ink, and Daniel Smith and QoR watercolor paints. I think these are my last lamps for a while. I’m not sure I want to become Kate-light! 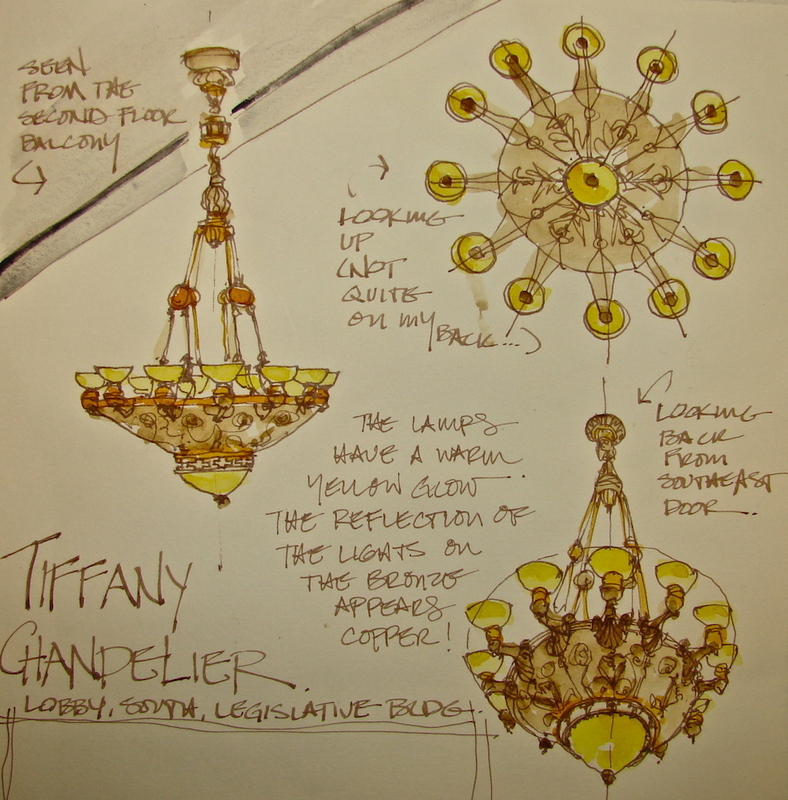 To draw this last Tiffany chandelier I could stand and rest my notebook on the marble railing, next to Big George. 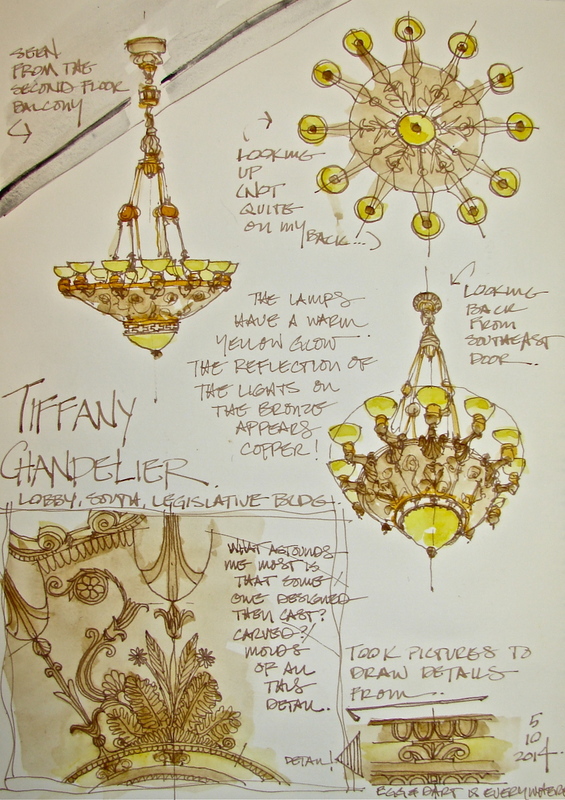 All of the Tiffany chandeliers have small design details that are sweet. I don’t know that photographs do it justice, and I doubt most folks walking through are able to notice. Drawing makes me notice. 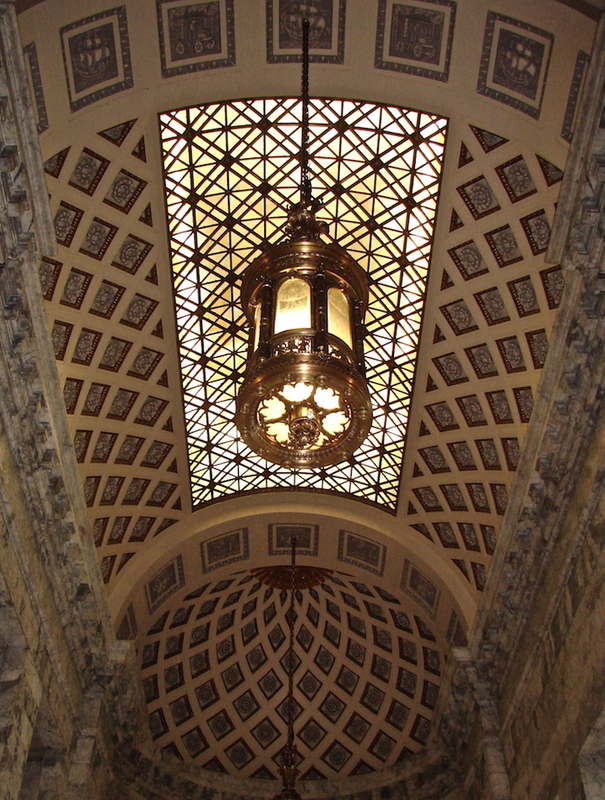 There are tiny (almost) hearts at the bottom of the dome (above) that allow light to shine through, and a floral filigree pattern on the bottom (all images get bigger). Teeny-tiny lights accent the floral pattern that graces the top of the lamp. 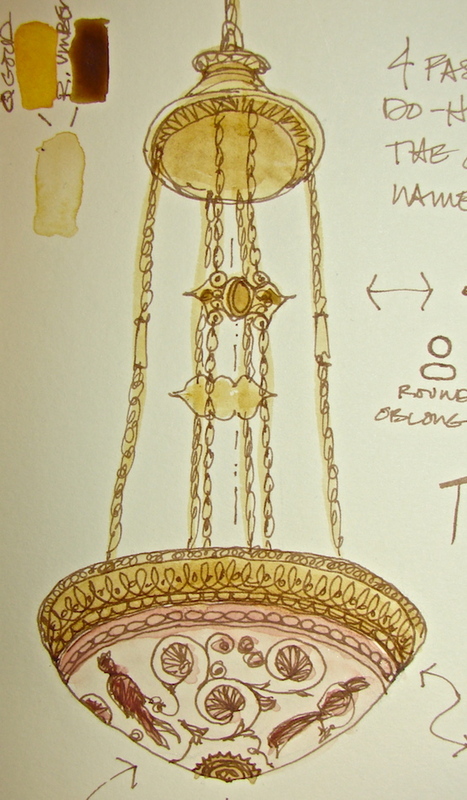 And the entire chandelier looks like a miniature gazebo, waiting for lovers! The entry is an unusual space. because the coves at either end simply suggest a split apart dome! 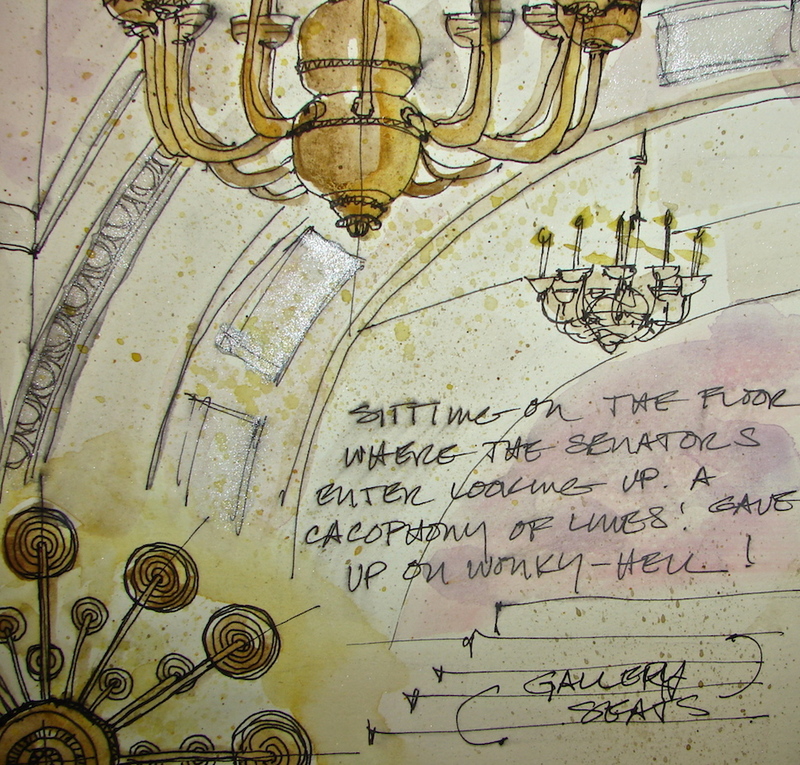 from hallways and in rooms in two different sketchbooks, so not sure which was where! I spent a bit of time sitting below one of the arches, contemplating the crazy spheres, arches, and marching colonnades in the dome tower. I would’ve liked to do the formal drawings for this building; right up my alley. Born at the wrong time! when it was still open. Apparently it is quite a hike (she was a teenager) with steep steps, and she remembers that. I’m not sure I’m up to it but I’d like to try! All drawn onsite in a Stillman & Birn Delta journal (rich ivory paper) with a Lamy Safari pen, a Pilot Preppie pen, and Polar Brown Noodlers ink. In the studio I added color: Daniel Smith (green umber, quinophthalone yellow, grey), Holbien (quinacridone gold = super creamy), QoR (terre green, bohemian green) and Sennelier (raw umber, quinacridone red, white) watercolors. the hands of architects who know how to use it. Legislative Building and on to the Justice entrance. beauty of the campus or various parts of the building. We came in the “back” door (southern entry) most days, and allowing for the fact that the central doors on both the North and South sides are permanently closed for repair, you can see the architect’s hand guiding you to various views. lovely cherry trees which were turning brilliant red and orange. 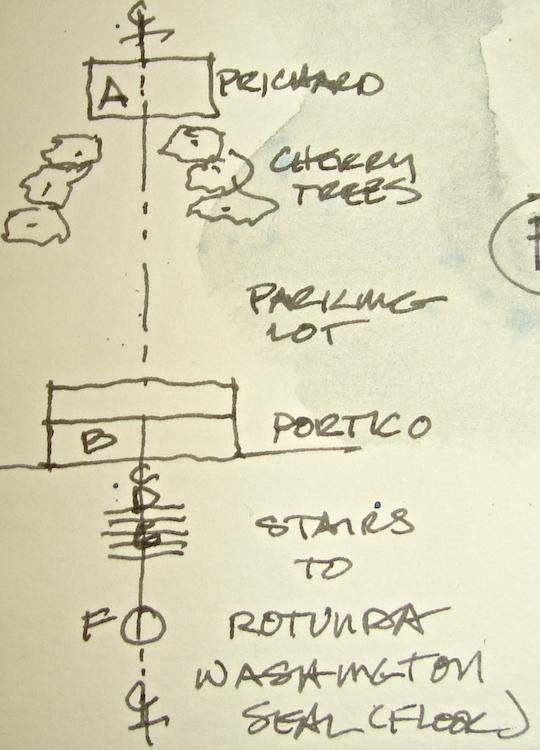 The path takes you through a narrow opening and you are under the drive-through portico. In Washington, the green grass really is that green as we head into autumn! blue-green umber patina, locked to keep it from swinging in winds or in an earthquake. 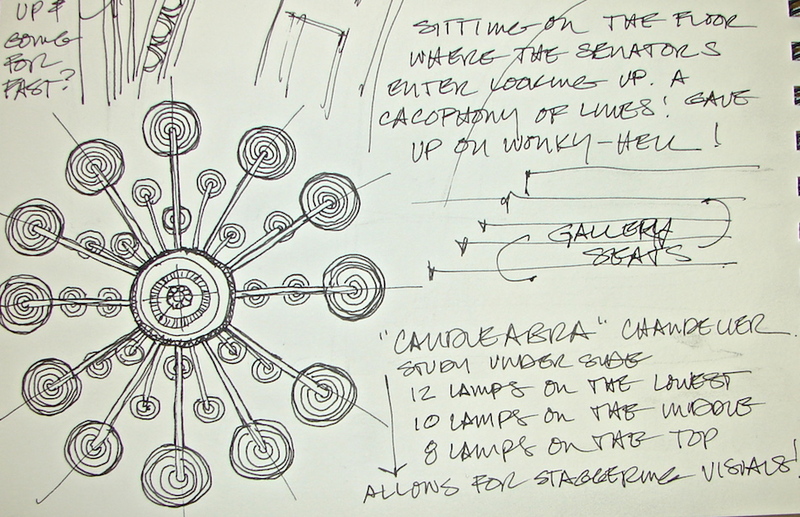 It is centered so that you walk directly under it, and the sketch I made onsite was of the symmetrical placement and motif looking up as you head for the entry doors. 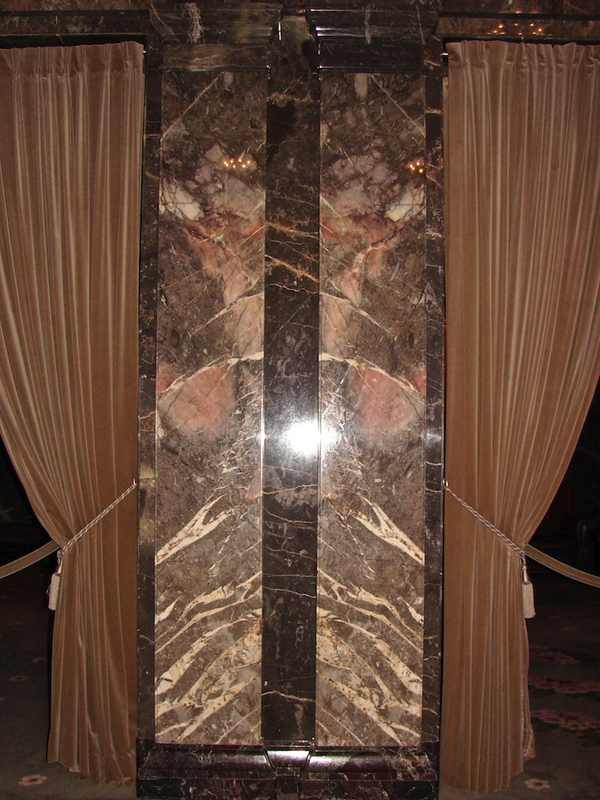 marble floors with a compass pattern in taupe and grey marble. 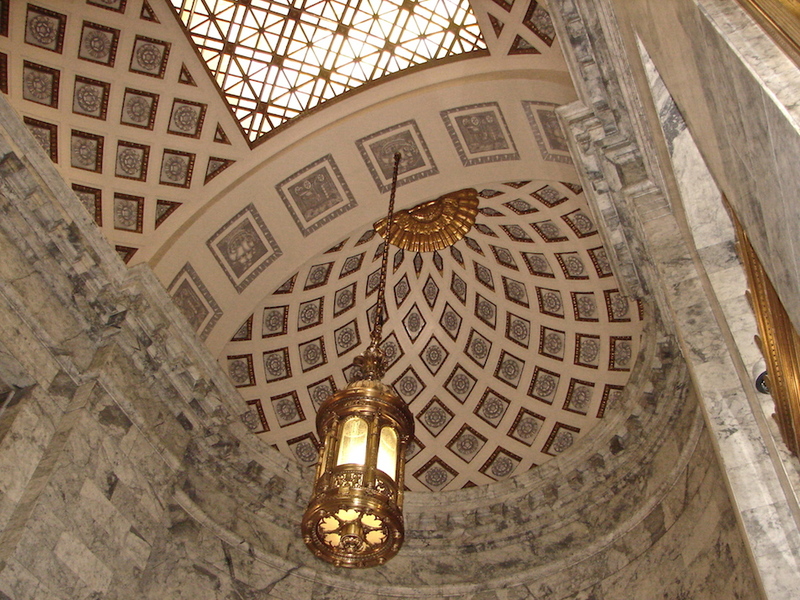 If you are standing on the compass and turn 180-degrees, you look up the grey marble stairs and see the elegant arch, columns, and see a smaller Tiffany chandelier that is covered in Greek figurines. 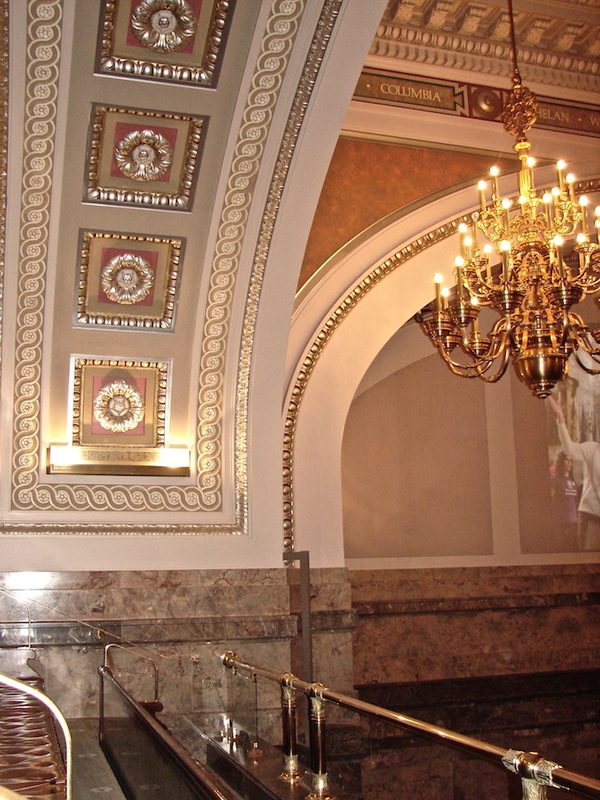 These chandeliers mark the hallways and paths throughout the building. I walked straight up those stairs, as a visiting dignitary might after the limo dropped her or him off at the Portico entry. 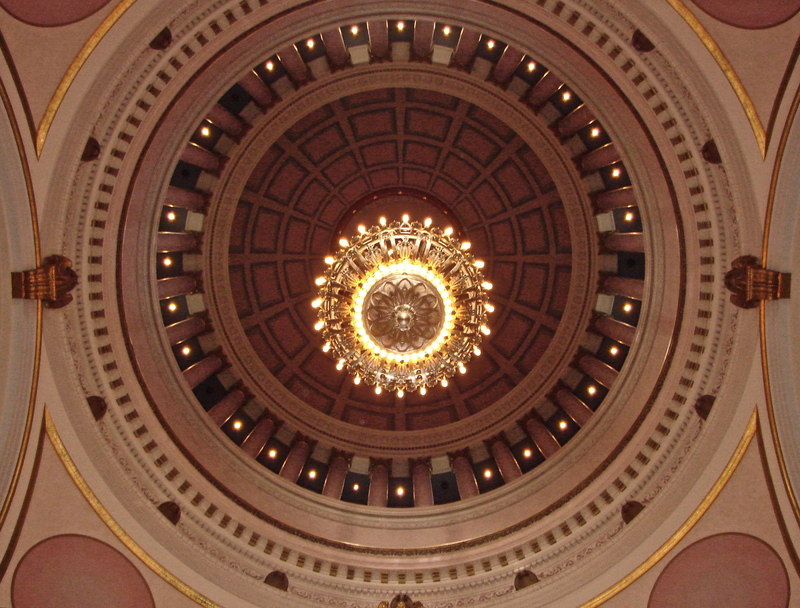 You look beyond and get your first glimpse of the Rotunda. On the balcony beyond you can see the Reception Room over the front entrance, flanked by two of the four torchéres that surround the State seal in the floor. in bronze is surrounding at this time by red velvet for viewing and to keep people from stepping on the seal. (even your own home town) that you would not have noticed. 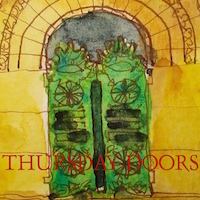 you to enter, and try to see what s/he wanted you to experience. I admit to running out of time sketching onsite for the day. I took pictures of the same theme of centered axial circulation from the Northern entrance and intend to sketch these images later to show the formality from the other side. 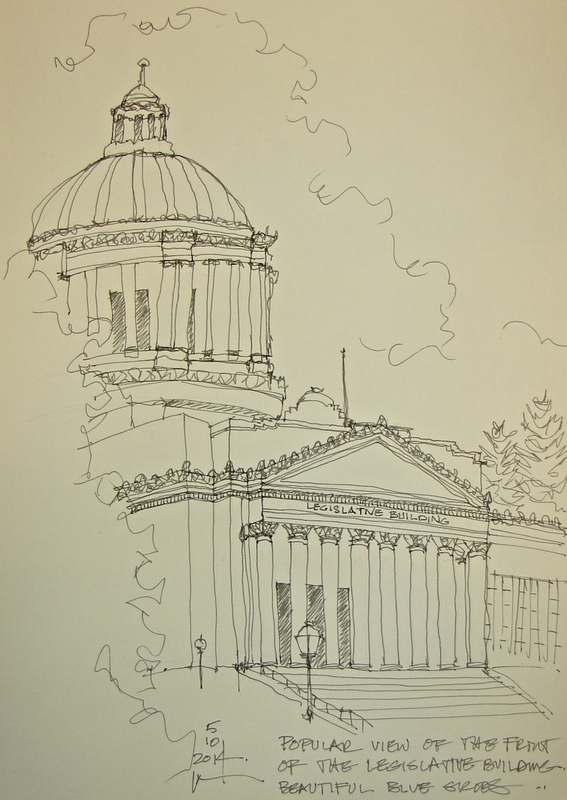 Or maybe I will wait until my next trip to the Capitol. Want to meet me for the grand tour? 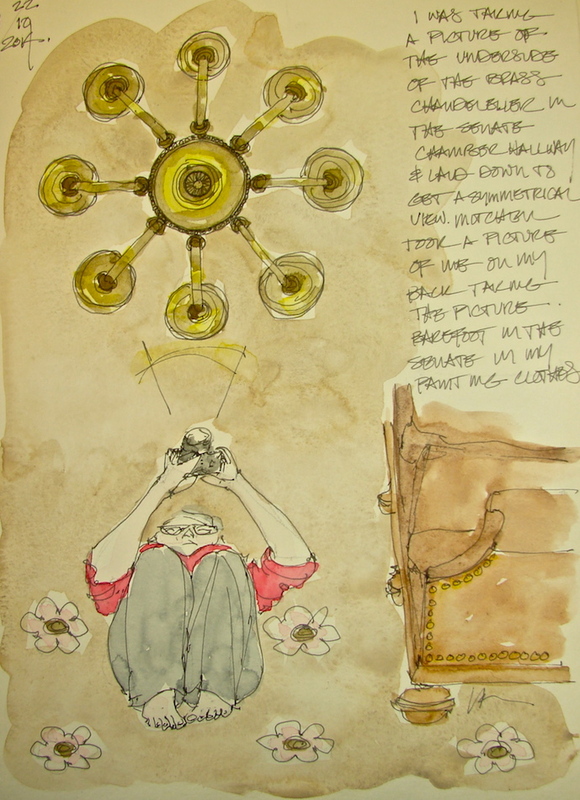 Drawings made onsite; watercolors added later in my studio. Senate Offices of the Legislative Building on the Washington State Capitol Campus, we crossed the grass in the pouring rain to the Justice Building. as well as an overhead skylight of some sort. 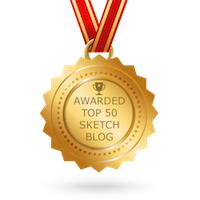 we had — I chose sketching instead. I only had time to sketch the overall and a side view detail of on lion, below, but I shot a detail image of the faces hoping that I might try my hand at them later. As always, I started with a pencil guideline, this time a watercolor pencil in a sepia tone. 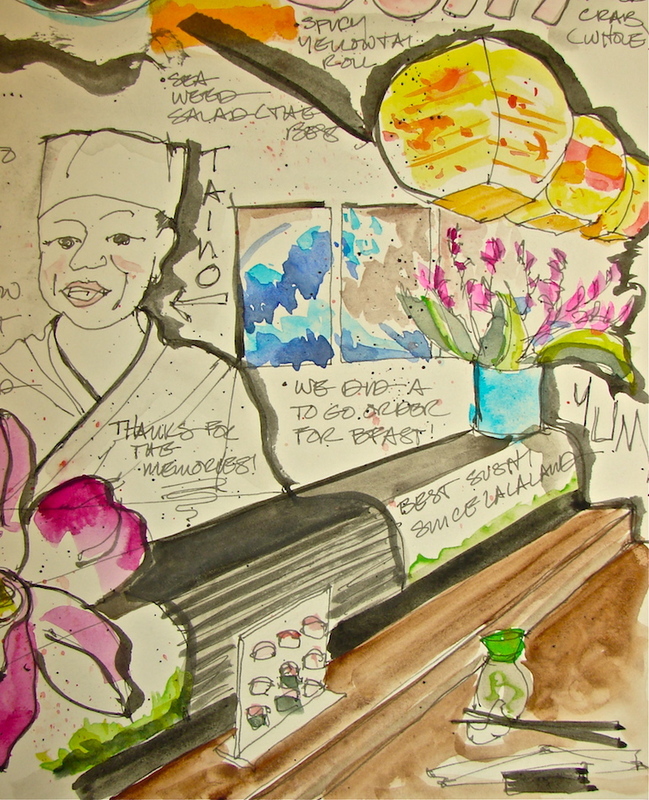 I love working in watercolor and ink, but am not a subscriber to the notion that pencils should not be used. As an architect I learned to use pencil guidelines, and this has transferred to my sketching habits as well. I simply am much more likely to leave them instead of erasing them, and I use watercolor pencils a lot more often. By giving myself a guideline I am much more able to be accurate in my sketching, and also I can relax and enjoy the inking process knowing that I have the basic shapes mapped out. After the pencil sketch and layout on my page, I inked the torchéres. I only had so much time, and so the inking was loosey-goosey. I was able to bring the sketches back into the studio (no watercolors in these buildings) and color them. 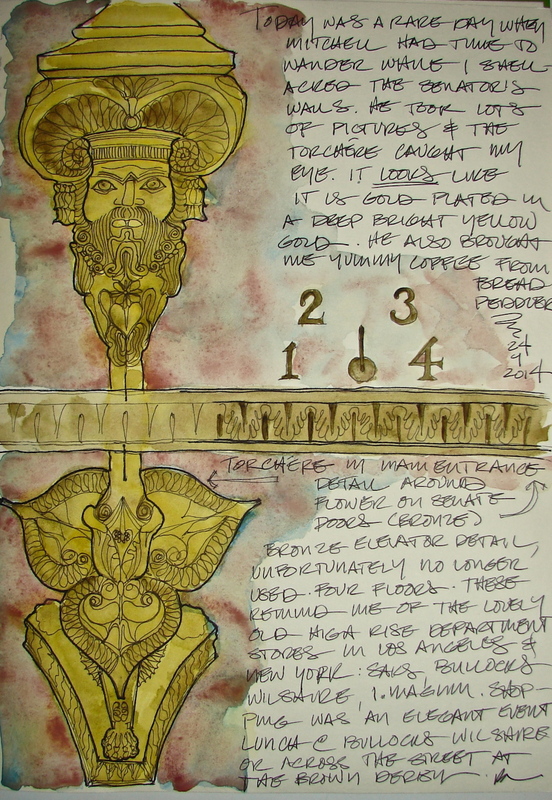 In this case I built up color in washes in both, starting with Quinophthalone Yellow for the illumination, and then working in washes that were mixes of Daniel Smith Quinacridone Gold, Yavapei (Primatek), and Yellow Iron Oxide. I layered color gradually and left white spaces when I could. The lion from the side view is one of my first pieces that I think is pretty good, though it is a bit harsh. a huge departure from acrylics, which I began this year. but rather an impression of what I loved about a place or event. As promised, their sweet faces, below. Think the sweet Cowardly Lion, not the predator! followed by a Platinum Preppy fountain pen with Polar Brown Noodlers ink. Daniel Smith watercolors added in studio. 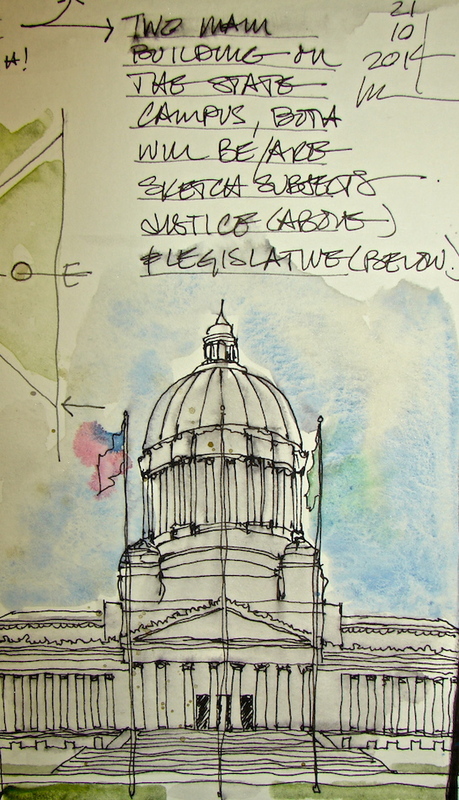 the Legislative Building (where we are working) and the Justice Building. 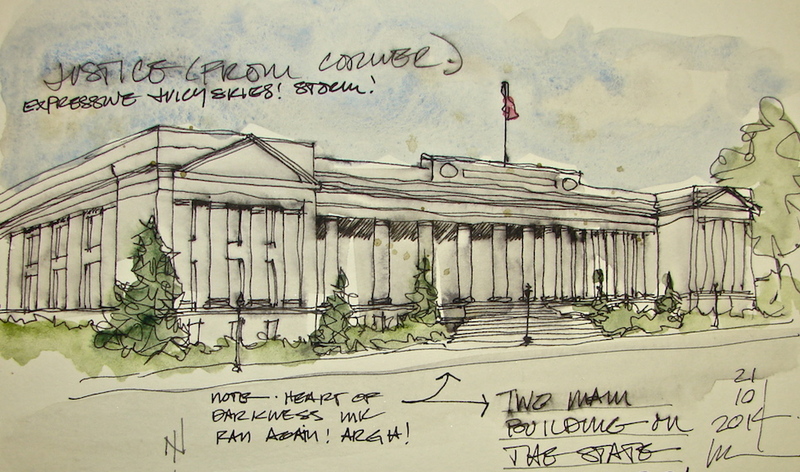 I started at the NW corner of the Legislative building to sketch the Justice building. and symmetry. Reading the two main buildings and their placement on the axis, I know how the architects intended a visitor’s experience (the original design, not the current traffic pattern). You were to enter formally from the main drag through one of two diagonal entrances. The entry forces you to turn around a statue (and possibly drive all around the statue) and glimpse differing angles of the two most important buildings. Then you take a turn around another grassy oblong where I can imagine a podium set for speeches, to see both buildings again as you parked in front of whichever building you were visiting. “No visitors, please.” We haven’t been; next time! If you wander too far South, you are caught by the catcher’s mitt the three buildings at the south end create, and forced back onto the axis. That experience is out a building flanked by two others on an angle (the only buildings placed at an angle in a very formal plan) that open up and gesture to the Legislative Building (wow, look at that!) You walk back through the South Port Cochere, through the Legislative Building (more on that formal layout later) and into the heart of the Justice Building. 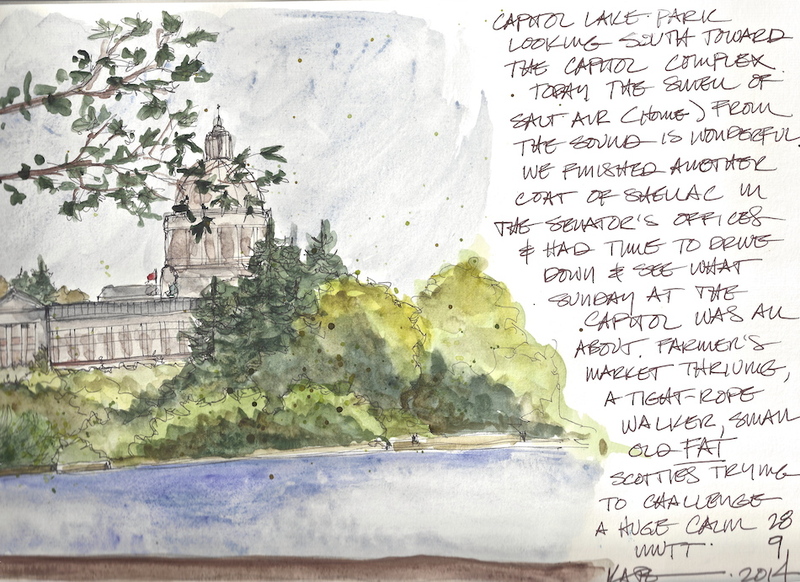 If you were cleared to walk through that building, you would exit formally to sit at Capitol Lake, enjoy the statuary, a lovely place to relax. I wonder if the energy between the constituents and the elected officials has changed significantly now that they no longer allow visitors to experience and enter the campus the way the architects intended? This is all about Feng Shui, yes, which by the way is not new and is good design. Now it is very hard to enter the way the layout suggests, both outside and inside, which I may write about later. We came in the back door (South) or side door (East) all but the very first time, when we met our guides on the Capitol steps. Also, I wonder if the chaos and sloppiness of our architecture has affected our people, making them sloppy and ineffectual and confused. I know so many people who vote to shoot themselves in the foot. Formality does imply structure, and seems to make us think. There is a place for it especially in these hallowed halls. But then I love symmetry! I just loved the deep inky blackness on the paper. Color was added in the studio, some fast washes, trying NOT to have it run! Lamy Safari pen with Noodlers Lexington Grey (which is waterproof) and Heart-of-Darkness ink; Daniel Smith + Sennelier watercolors then Pitt pen to bold it. 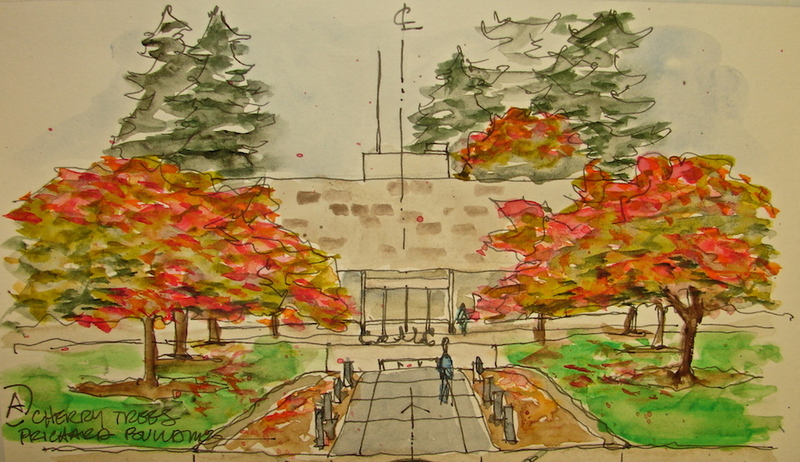 My last sketch onsite from earlier in the year, with watercolors added Sunday. It was pouring, our work at the Capitol completed, and we were on our way home. Mitchell wanted to explore the Justice Building. we spent a good amount of time talking with the Librarian. We had just a little bit of time. are perhaps the scariest I’ve ever seen. all made to look a bit like a tower. You can almost imagine the princess held prisoner . 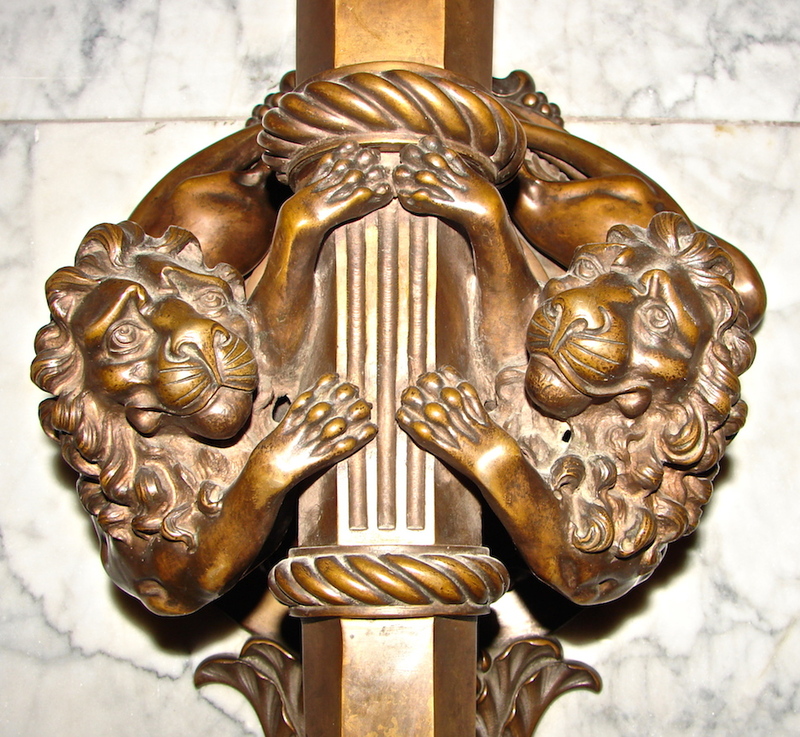 . .
the Lion Torchéres on the entry walls. More postings will be added as completed!